Disclaimer: The following posts are the personal opinion and experiences by Club Past President John Brantmeier. They do not reflect or are endorsed as the official position of Red Arrow Snowmobile ATV Club Inc. They are posted merely to give website visitors an idea where you might want to ride. E-mail John at jbrantmeier@athenet.net if you want to comment on these reports. If you want to post your rides or send photos for the website you can send them to John’s e-address above for consideration. Friday February 26th Finally get to ride again. Ron Popp and I are going to make the Crocker Hills run one more time this season. We met about 10:30 at the T just north of Townsend and took the short loop up to Wildwood Trail and over to the Valley Inn. The 100 Miler groomer had just been thru so we followed the old Red Ball over to the T and headed west to Lily. The Lily trails were freshly groomed all the way to the Lily clubhouse. As we headed thru the Crocker Hills we were pleasantly surprised to see that their groomer had just done the whole system all the way south. We were glad we had one last chance to ride those beautiful rolling hills. Once we got back to the Wolf River State Trail we had fresh groomed trails all the way to White Lake. Lunch at the Black Bear where we met up with Andy Kostelny who was hauling seed corn. Good lunch and nice chat and we were on our way back east. As usual the area around the Langlade Bridge was really bad but we gritted out teeth and soon got to better snow east of Langlade. The Polar groomer was out doing the Boulder Lake trails and they were flat but short on lubrication so he headed north towards Townsend via Saul Springs and the Bob Kroll Memorial. Red Arrow trails were groomed a few days ago and were flat with some loose snow. Be careful of some bumps not filled in with snow and a few rocks popping thru. Trail was good all the way to the Valley Inn and back down to Surprise Lake where we cut across to the Townsend Flowage and back home. 85 miles of really nice riding with temps in the high 20s and almost all freshly groomed trails.Now have ridden about 950 miles this season which is way below normal. Usually at least 2000 miles for me. A late start and multiple warm-ups have made for a tough year. All the clubs have done a great job with the small amount of snow that we have gotten. Hope we can ride some more in March. All the grandkids, Dave, Kristin, Troy and me getting ready to ride the lake. Saturday February 20th Kids and grandkids came up for the weekend expecting to do some trail riding. The air temperature was 45 degrees today so we settled for a campfire and 3 laps around the entire Townsend Flowage. We now know that it is a little over 6 miles around the flowage going as far as the Red Maple Boat Landing and the landing on the upper part of the flowage. Did not venture into the shallows at the north end with grandkids on board. Fun but now what we expected. Always great to have the whole family gather. Linda and me by the campfire with all the grandkids. Thursday February 18th Ron Popp and I went for a ride to beat the expected Friday warm-up. Left Townsend Shell at 9AM and took the outer loop and Wildwood Trail to the Valley Inn and then down the Bob Kroll to Animal’s Bear Trail. Headed south on Chute Pond Trail to Hwy W and across to the “tunnel trail” and back up the grade. This was a grand total of 76 miles in 2hours and 10 minutes so you know the trails were great all the way. Thanks to Red Arrow and Chute Pond for getting out and grooming what snow we have to work with. Last Ride?? Monday February 15th: Today Jim Wisneski, Larry Market, Larry Westphal and I were on a mission to check out some signage over by the pipeline. Last year we surveyed the area and got GPS readings for our new Oconto County Snowmobile Map. There were a couple of reroutes and a missing sign so we rode over to see things in person. We met at Lakewood Shell (except Jim who met us at the BP in Mountain) and we headed south on the grade to Corridor 18 east, around behind the Junction and over to the White Potato Lake area. The signs there were in the correct spots but we will have to remark the map as it now goes thru a swamp instead of along the road between locator 433 and 435. Then we headed south across Hwy 64 to the pipeline. Here there are both ATV and Snowmobile trails plus a re-route of the trail at Sleeter Road. We took some new GPS reading and decided to add a new #408 locator between 409 and 407. This is an are where both ATVs and Snowmobiles share a trail. Then we took the pipeline back towards Crooked Lake and on to lunch at Prospect Lodge and back home via the back trail past the ski hill. Overall we had about 130 miles of good to very good riding. Longest trip of the year for me and the season stands at 760 miles so far. A warm-up coming this weekend will keep us off the trails. Hope you stay off too as it will just wreck things for the rest of the season. Ride Safe and Ride Sober! Sunday February 14th: Been too busy for me to ride this weekend but did take the new (to me) two-up out for a spin Friday afternoon. The trails around Townsend were all freshly groomed and in great condition. Wish I had time this weekend for more but had to settle for about 30 miles of test/tune time. Someone had set the sled really firm and loosened things up a little as it will be mostly grandkids on the back. Thursday February 10th: Another very cold day but we gathered at Townsend Shell for an old fashioned bar hopping trip. We rode out east of Townsend and took the outer loop up to Wildwood Trail and back down to the Valley Inn. From there down the Bob Kroll and Saul Springs Road to animal’s Bear Trail. We stopped to warm up and had some hot chocolate and sodas and then headed south to Boulder Lake, crossed Hwy 64 and west to Fish Hatchery Road. There we turned north and went to the Lily Intersection and up to 9 Mile Resort the “back way” for a great sandwich lunch and more warming up. Finally, we took the “front way” back to Townsend via Saul Springs and the trail towards the Valley Inn. All trails we rode today were in excellent condition!! After a refreshment stop at the Valley Inn we headed back to the lake house. Riders today included me, my cousin Dave Stehula, Mary Stehula, Ron Popp and his friend Tim from Appleton, Mark Bies and Bernie and Julie Bangert. It was a great day to be in the wood and we ran a total of 81 miles. About 600 miles for the season so far. Making up for lost time with 3 rides this week. Wednesday February 1oth A very cold day to ride with the temperature around 10 degrees at 10AM. Our goal today was the Whitetail Inn in Tipler. We headed straight north on the Nicolet Trail to the Bushhaver connector north of Wabeno. This is the second trail to the left after leaving Wabeno and marked as going to Roberts Lake. It takes Bushhaver road that is plowed by very rideable and turns into LMT 8 and a very nice smooth ride to Roberts Lake. Sadly the next leg north on the 100 Miler was very bumpy and had not been groomed this week or at least it seemed that way. We rode slowly up to Intersection 26 and north to Hwy 8. There were some better spots where there were roads underneath but for the most part bumpy. The trail to Arrgonne between intersections 32 and 33 was awesome. Freshly groomed this morning. The same from Argonne all the way back to Nicolet Trail south of Newald. I wish I had looked at the odometer but I think it was nearly 40 miles of absolutely primo riding. Hats off to the Argonne groomer for laying down a great trail. We went to CJ’s in Newald for lunch as the slow going made Tipler out of the question. The folks at CJs said the 100 Miler tractor was broke down so that is why their trail was so bad. After lunch we headed south and caught up with the 100 Miler Tucker from Armstrong Creek. We thought we would have smooth going but shortly after passing him we encountered awful conditions on the Nicolet Trail almost to Laona. Maybe this part is covered by the broken tractor. Not sure if the Tucker was going all the way to Laona but I sure hope so. It was bad. From Laona back to Townsend the Nicolet Trail was in great shape. I know 100 Miler and LMT share parts of this section so not sure who did the great job but thanks guys. Bottom line 80 miles of pure heaven and 25 miles of hell today. All in all a great time to be out having fun. Tuesday February 9th After a successful Fish A Ree and Monday cleaning up from the event we finally got back on the trail. I met Ron Popp, Larry Market and Mark Bies Shell station. Larry was now officially the owner of the Vector but he picked it up at my house and we rode over to Shell together. We took the Nicolet Trail up to the Valley Inn, and turns west and south on Mosquito Lake Road and the Bob Kroll Memorial trail. At Saul Springs road we turned towards Langlade County and crossed the bridge at Langlade. Then we headed over to the Wolf River Trail and lunch at the Black Bear in White Lake. Great food as usual and a chance to warm up. After lunch we backtracked and dropped Mark off south of Townsend. This was his first time out after surgery so he was taking it a little easy. We then headed back to the Valley Inn, crossed Hwy 32 and then took Wildwood Trail and the Outer Loop back to Townsend. Every bit of trail was awesome except for a short stretch west of Langlade. A perfect day for a ride and about 80 miles on the clock. February 3-5 After 6 inches of fresh snow earlier in the week, on Wednesday the 3rd I took about a 50 mile loop around our Red Arrow trails just to check things out. generally speaking they were in really nice shape and the groomers had been out. Thursday was the “big day” as Discover Wisconsin was in town to do some winter filming for a Oconto County program in late March. They set up some shots at the groomer garage and out on Mosquito Lake Road and the pretty trout stream near by. About 7 of us were “b roll” actors with our sleds meaning that we just ride for the camera with no speaking shots. It was lots of fun to be part of this and see how a show is made. On Friday I picked up a used Venture 2-up sled from a fellow club member. A really clean 2011 with only a little over 2,000 miles. Got to ride it home and made a 30 mile loop out around the ski hill and Wildwood Trail. The 2008 Vector 40th Anniversay I bought new found a new home with fellow club member Larry Market. With 4 grandkids having a couple of two-ups will serve our needs better. Still have 4 sleds but considering selling the 2007 Attak GT with 6,000 miles. The Attak is essentially the same sled as newer long track Apex models and has the big 1000 cc 4cyl engine. Saturday and Sunday were Fish A Ree days so no riding over the weekend. January 28th:A great day to go out for a ride. Larry Market, Joe Harrison and Ron Popp joined me with the goal of getting to Ed’s Main Street in Argonne for lunch. We took off from Townsend Shell shortly after 9AM. The Nicolet Trail north looked good but we decided to go into the woods just north of the salt shed in Townsend. Tip: This is a very scenic area and saves you crossing Hwy 32 twice. You can take either the long loop to location # 641 and turn left or earlier take the short loop at #645. Both will get you to Wildwood Trail and the county line. If you are headed for the Valley Inn and west take the Lower Loop at #637. You will go past the scenic overlook cut off and join the Nicolet Trail just across the road from the Valley Inn. We decided to take the short loop and up Wildwood Trail to the Nicolet and turn south coming out at the same place the short loop intersects the main trail. We crossed Hwy 32 and took the Mosquito Lake Road trail to the 100 Miler at Diamond Roof Road. To that point all trails were in good to very good condition. Once we hit the 100 Miler it was a different story. This trail all the way to Johnny’s had not been groomed since the weekend traffic and was bumpy all the way. Slow going today. Once we got to Hwy 8 things changed for the better. The road trails across 8 were smooth and in good shape. As we got to the cutoff to Argonne (Intersection 8) we were pleasantly surprised to see virgin groomed trails. It was a smooth going to a couple of miles south of Argonne where another groomer takes over. This also had not been groomed since the weekend. Ed the owner of Main Street greeted us as we arrived to a packed house. Snowmobilers, loggers and other folks were enjoying a hearty lunch. There were even two Forest County Sheriff snow patrol guys there having lunch. Don’t miss a chance to try this place. Ed smokes his own beef and pork along with a great menu for lots of other stuff. The chef even wears a white coat. Not what you would expect way out in the woods. After lunch we headed back the same way as far as intersection 27. We did catch up with the 100 Miler groomer going south but it appeared he was only panning and the bumps were not going away. LMT 8 from #27 was in really good shape and we quickly got to the Nicolet Trail. Surprisingly the Nicolet was in good shape all the way back to Townsend. Again, instead of crossing Hwy 32 we took the Lower Loop and came around the Short Loop into town. If this sounds confusing get an Oconto County and a Forest County map and trace out the route. A great ride once the 100 Miler gets their trail back in shape. In all fairness this is probably the most heavily traveled trail westbound. Usually it is in great shape. Back home at 3PM with 99 miles on the clock. Great ride with great friends. January 21st: A lot warmer today. Yesterday I took about a 30 mile trip around the Red Arrow trails just to check things out. The grade is thin but generally speaking the trails in the woods are very rideable as long as you watch for that occasional rut or rock. Ron Popp, Larry Market and I decided to ride to the Crocker Hills west of Lily today. This is always one of my favorite trips. After going out the Red Arrow long loop we picked up LMT 2. LMT has been grooming it regularly but it was very thin. I would recommend riding north to Bushhaver or down towards Boulder Lake and Langlade to go to Lily. That said the trail from Ada Lake Road to Lily was pretty good except near Lily where they are logging. We went into Lily over the Lily Riders Club House (closed) and continued on thru the Crocker Hills. Wow…the trails in there were Very Good. Keep bearing left at the turns and soon you will find yourself seeing signs for White Lake. We took the Wolf River State Trail down and it was Very Good. Lunch at the bar in town (the regular restaurant is closed) and the food was great. Ran into some old friends (Welhouse Bros) who had ridden over from Pickeral. They said things were good that way also. After lunch we headed east to Fish Hatchery Road, Saul Springs Road and Townsend. Final stretch was across the Townsend Flowage that is now getting ridden regularly (you are at your own risk of course). About 90 miles on the clock for a season total of 350. Not bad considering the snow depth. It was zero degrees, but warming steadily under sunny skies when I met John and Ron at the Townsend Shell at 10:00 am today. They rode over to meet me, and I trailered up for a scouting ride to help decide if trails would be good enough to hold the MS Snow Tour next weekend. I fueled up and we crossed Hwy 32 and took off heading north on the Nicolet State Trail (NST). The trail was groomed flat and smooth, with some gravel mixed in with the snow in a few places along the way. Just north of town we took a right and headed into the woods, following the “Short Loop” over to the Wildwood Trail, which took us back to the NST. Since I was leading at that point, I felt it was only right to stop and compliment Ron on the condition of the Red Arrow trails- where he is one of the groomer drivers. The trails so far had been in good to very good early season condition. We turned right onto the NST and followed a well groomed trail into Forest County, where the 100 Mile Snow Safari took over the grooming. The trail was flat and smooth past the Carter Casino and up to Wabeno, although there were some gravelly stretches along the way. Just south of town in Wabeno, we took a right turn and followed the 16E trail into the woods. The 16E trail was panned, but worn down pretty well to a thin and bumpy (fair early season condition) ride up to intersection 30, where we turned west onto the freshly groomed LMT 8. The groomer actually had the cutter blades down as he headed west, and the trail had set up into a hard and mostly flat surface. This trail was a really nice ride west to the Nicolet State trail, where we made a short ride south on a nicely groomed but slightly gravelly trail to turn west onto the LMT 8 once again. We crossed Hwy 32 and enjoyed a well groomed (in good early season condition) ride to a short section of 100 Miler trail south before picking up the LMT 8 again. We followed the LMT 8 west to the LMT 6, which led us north and west to the Wolf River State Trail (WRST), just south of Crandon. We took the well groomed WRST south, enjoying a smooth ride but also encountering the seemingly always present rocks mixed in with the snow in several areas. We followed the old railroad bed south to Lily, then turned north and east on the 9/16 trail. Right outside of town we found more than the usual logging activity, which compacted the trail for a few miles, but there was still snow and ice to ride on all along the way. Once past the logging zone, trails improved to good early season condition as we followed the 16E, then the 100 Miler which brought us back to the Oconto County Line. We took Red Arrow trails to The Valley Inn for lunch, only to find it closed, so we headed down the NST to Old Town Hall and enjoyed tasty soup and sandwiches for lunch. We visited for quite a while, with John and Ron telling snowmobile stories dating back as far as 1968. It was really nice to spend time talking sledding with a couple guys who know their stuff. We all agreed that the trails we rode today would be more than adequate to support the 155 riders coming next weekend for the MS Snow Tour. I thanked them for their companionship and guidance, and trailered up- completing an 81 mile ride based on my odometer. Both John and Ron showed quite a few more miles than 81, but I have no good explanation for that. Mine showed 81and it’s always matched other sleds I ride with- I’ll keep an eye on it next time I ride. January 14th, 2016 Finally the first ride of the season. Larry Market and I went out to check Red Arrow Trails. We headed north from Townsend Shell to the right hand cut off into the woods. We took the outer loop around Wildwood Trail and were pleasantly surprised. Only a few stones and ruts. For the most part good early season conditions. We headed south on the Nicolet Trail to The Valley Inn and then up Mosquito Lake Road. Have to say that section could not get much better! Then on the Jeff Kroll Memorial down to Animals. Some truck ruts and stones until we got down to Saul Springs Road. The road trail to Animals was Very Good. We heard that south of Animal’s there is not much snow so we backtracked to Carl’s kiosk and took a right up Pine Tree to the Backwoods Pub. From there we took the Paul Bunyan trail over to Cathedral Pines. This section has some bumps and ruts but plenty of snow cover. We took the Cathedral Pines trail back up to Townsend Shell and put about 50 miles a the clock. Overall a really decent day of riding. Short Video of the view from the scenic overlook just north of Townsend…Check it out!! Trails closed for the 2014-2015 season after a big warm-up over the 6-8th weekend. See you soon for ATV/UTV season!!! March 6th, Friday Last ride of the season!!! Trails burned down quickly over the weekend and guessing they will be closed soon for sure. Rode about50 miles around the Red Arrow system checking out some signs that need to be ordered. March 5th, Thursday Today was a busy day but had time for a quick 50 mile ride around the Red Arrow system. All trails were freshly groomed and should be in good shape for the weekend if it does not get too warm. Main goal was to check out some intersections for fresh signage for next year. Also took care of some signage issues on Hemlock Dam Road. Since the town started plowing that intersection it was a little unclear where the trail headed north. Let me know if it still causes problems but I think the problem is fixed. Ride safe and sober!!! March 4th, Wednesday Today was a very cold sunny day but the riding conditions were great. Dan Guendert, Jim Hertsberg and I met at Townsend Shell at 9AM and headed north. First we took the Red Arrow Lower Loop to the Scenic Overlook just across from Barb’s Valley Inn. What an awesome view of Townsend and points south. Then it was up the 100 Miler Red Ball to Roberts Lake and Hwy 8 over to near Crandon. The trail to Arrogone was freshly groomed so we headed north and had lunch at Eds in downtown Arrogone. Awesome food and reasonable prices. You need to check this place out. Then we took the trail north towards the Nicolet Trail. 22 miles of awesome wood riding and my personal favorite when it is groomed. Then we headed south on the Nicolet Trail to Laona and west to the 100 Miler trail south just west of Cheney’ resort. This is a hidden gem that not a lot of people use and today it was perfectly groomed. Then we backtracked to Townsend and arrived there about 3PM with just over 130 miles for the day. That tips the 2000 mark for the year with 2068 on the clock!! Great trails and good friends made for a great day on the trail. February 26th, Thursday Today was our annual ride with staff from the Lakewood Ranger Station. The day was cold (about 10 above) but we started out on an optimistic note and checked out the Red Arrow outer loop and the scenic overlook. Then a few miles up the trail one of the Forest Service sleds blew a belt and no spare along changed plans. By the time we got the sled loaded on a trailer the Forest Staff people decided to call it a day. The rest of us rode down to Animal’s Bear Trail for lunch and then headed back for home with about 75 miles for the day. February 25th, Wednesday Today we planned to get some more use from our Michigan trail pass but the cold weather changed our plans. Jim Wisneski, Dan Guendert, Jim Hertsberg and I decided to finish up the Chute Pond part of our new GPS project and spent the day riding from south of Chute Pond over to the Bagley/Brazeau area intersections and then to White Potato Lake for lunch at Brads. Great Walleye plate special for only 6 bucks!! After lunch we headed up towards Crooked Lake to get the final intersections GPS readings and back home via the trail to intersection 41 just south of Tar Dam Road. Parted company with the guys and headed back to Townsend and home where the odometer read 127 miles for the day. Mostly great trails except low snow conditions southeast of Mountain and over in the White Potato Lake area. All told so far I have ridden 1863 miles this year. February 24th, Tuesday Jim Wisneski and I have spent the yesterday and today riding most all of the trails in Northern Oconto County. That included all of the Red Arrow, Paul Bunyan and Chute Pond trails. We were taking GPS readings at all intersections for snowmobile trails and some ATV intersections that were along the way. The goal is to have all snowmobile and ATV/UTV intersections in the county have accurate GPS readings. Next fall we will be changing over our snowmobile and ATV trail numbers to one common set of numbers for the whole county. More on that to come but in the last two days we covered about 160 miles on our sleds. I have to say that every trail we were on was in great shape. Considering the low snow totals it is hard to believe that they are so good. Hats off to the groomer drivers from all three clubs for a superb job!! February 20th, Friday Finally back on the sled after a two week layoff. With the Fish A Ree, the Flu, appointments and the cold weather two weeks flew by. Made a 50 mile loop around Red Arrow East side Trails crossed over Hwy 32 and down to Animal’s Bear Trail via Saul Springs Road. Everything was in awesome shape for the weekend. Took Chute Pond’s trail south to the four way intersection and then back towards Half Way Bar. Saw a young man roll his sled on a curve while riding with his family. Stopped to help but they said everything was good so carried on to the Nicolet Trail and back home to Townsend. The whole ride took just under 2 hours so you can believe the trails are in very good shape. The 2-3 inches of snow expected should add a nice top to things. Good to be back in the saddle again. February 6th, Friday Brother Mike and I went out for a quick 95 mile ride this morning. Left our cottage at 9AM and headed north via the Red Arrow Short Loop and the new Lower Loop over to Barb’s Valley Inn. Then North on the 100 Miler Red Ball but cut off and took the Water Tower Trail to Wabeno (LMT 4 I Think). Both were groomed yesterday and showing a little wear today but not bad considering no fresh snow. We crossed over to the Nicolet Trail to Laona and things got a little tougher. Stones showing thru the snow all the way up. I would strongly suggest getting a Forest County Map and riding in the woods whenever possible this weekend. We stopped at the Double Buck for a great breakfast served hot as usual and then headed west to the first T south…Awesome!!! The 100 miler had this trail in great shape all the way south. Met up with lots of riders this morning. Some hot dogs and several groups of couples out for the day. Lots warmer than yesterday for sure!! We took the Bob Kroll Memorial south to Pine Tree Road and circled east at Beavers/Cathedral Pine on the Paul Bunyan trail to Lakewood…very nicely groomed indeed!! Then north past the real Cathedral Pines to the Shell station and back home at 12:30. Great day to be out in the woods. Again, don’t forget our Red Arrow Fish A Ree this weekend. Sat and Sun at the Townsend Town Hall. Full details on the home page of this site. February 5th, Thursday One of the best days of riding ever!!! My brother Mike, Jim Wisneski, our friend Bill from Ford and I put on 145 miles and not a single bump the whole day. Every single mile of trail was freshly groomed. We started out on the Red Arrow east side trails before heading north on the old 100 Miler Red Ball (starts at Barb’s Valley Inn) and took that all the way up to Johnnie’s Resort. Then we crossed Hwy 8 and road over towards Crandon and picked up the trail to Arrogonne. This one is sometimes iffy but today it was awesome. Ran about 30 miles around Arrogonne and back to the Nicolet Trail. Perfect Conditions! Next we went up the Nicolet for a short distance and turned left to Armstrong Creek for gas and lunch at the Green Shack. Awesome Chicago style sandwiches. Then back to Wabeno and down the Nicolet to the county line. It was only 3PM so we took Wildwood Trail and the long loop back to Townsend for a great finish to an awesome day. If anyone thinks the trails are not good up here think again!!! All the clubs are grooming like crazy to make things good for the riders. Don’t forget our Red Arrow Fish A Ree this weekend. Sat and Sun at the Townsend Town Hall. Full details on the home page of this site. February 3rd, Saturday Great weekend at the lake with daughter Kristin, husband Dave their kids and their friends James and Betsey. Got all the sleds gassed and did about 60 miles showing them all around the area and then they went out for another 3 hours on their own while Linda and I played with the grandkids…great way to spend a weekend for sure. January 28-30, Tues-Thur Three days of great riding to Michigan!! On Tuesday Jim Wisneski, Tom Berghuis and I took off from Townsend and headed straight up the Nicolet Trail to Iron River, Mi. It’s only about 60 miles now as we happily discovered that the long talked about bridge over the Brule River was finished this fall. After gassing up and getting a burger in Iron River we headed West on Trail 2 for Watersmeet and a 2 night stay at the Casino (for the cheap rates not the gambling) of course. It was only about 3 PM so we headed on down to Land O Lakes to do some sightseeing and checked out the historic Gateway Lodge…a wonderful old place. Then back to Watersmeet for dinner and a good nights sleep with about 130 miles for the day .. On Wednesday morning we got up early and rode about 150 miles north and east on mostly well groomed trails. Check out the awesome Bond Falls above!! Thursday was back to Wisconsin day and we headed south thru Eagle River, Three Lakes, Monico and Crandon before hitting our Nicolet Trail at Laona and home with about 140 miles for the day. Overall a great 420 mile journey. First time in the UP in 7 years and not much has changed. Mostly guys on fast sleds with lots of them from Illinois and Iowa. Only negative is the 45 dollar trail pass for the season but compared to what sports game tickets cost these days its still a pretty good value. January 22nd, Thursday Another great day to be in the northwoods!! Conditions were perfect at 9AM today when I met four Red Arrow friends at Townsend Shell for a ride north. Red Arrow had freshly groomed the Nicolet Trail so we took it north and around the short loop and lower loop to the Valley Inn. This saves crossing Highway 32 twice. The 100 Miler Red Ball still had not been groomed so we got off at the Lily cut off and had smooth trails all the way to the Wolf River trail north to Crandon. The northern part near Crandon had lots of stutter bumps but was very rideable. Then thru Crandon and over to the trail north to Arogonne for lunch at Ed’s. Great home made food and portions way too big. We were pleasantly surprised to see the groomer had just been north and we had 25 miles of glorious riding to the Nicolet Trail. If you have never gone this way make it a must. All timber land with nice wide turns and lots of scenery. Then back to Townsend via the Nicolet Trail. Good conditions all the way back. Great job LMT and 100 Miler clubs. 115 miles of the best riding of the year!!! Sunny and temps in the 20s made for a great day to be riding with friends. Not sure how things will hold up over the weekend but suggest going north from Townsend into northern Langlade and Forest County. Lots more snow up that way and less riding pressure especially if you stay off the Nicolet and Wolf River State Trails. January 20th, Tuesday Longest ride of the season so far at 145 miles. We started early about 9AM with the goal of the big loop around Three Lakes and Hiles but plans changed. Took the Red Arrow Short loop to the 100 Miler Red Ball and headed north towards Johnnies Resort. Conditions were mixed with some trails pristine and others not groomed since the weekend but plenty of snow cover. We always enjoy the ride from Johnnies up the “back way” to the Nicolet Trail but today it was not freshly groomed and lots of stutter bumps. Luckily once we got to the Nicolet Trail things were much improved and we headed north with the idea of heading over towards Arrogonne for lunch but that trail was not groomed either so Plan B. Since the 100 Miler groomer had just done the Nicolet Trail we guessed he was headed back to Armstrong Creek and we had a great ride with us being the first sleds on the trail much of the way. Lunch in the Creek and then back to Wabeno. The 100 Miler Groomer had continued on to do the south leg of his run to Wabeno so we had fresh groomed trails all the way back. The Nicolet Trail to Townsend was in surprisingly good shape and the 2 inches of fresh snow last night helped a lot. All in all a great day to be riding with temps in the 20s and no sun to burn out the trail. Conditions up here continue to be fair to Very Good depending on which trail you are on and when they were groomed. Personally I am going to stay off the Nicolet Trail as much as possible and look for freshly groomed trails in the woods. January 19th, Monday Took a quick 25 mile trip this afternoon down to Lakewood Motorsports and around to the Ski Hill. Check out what is probably the first snowmobile round a bout just east of Lakewood at a three way intersection. Very cool!!! Trail is pretty thin from Lakewood to the air park but improves as you go north. We need some snow but Red Arrow and Paul Bunyan are doing a great job of keeping things groomed and as smooth as possible. Biggest issues are washed out corners and open fields where there was less snow to start with. More riding tomorrow. January 15th, Thursday A group of seven Red Arrow members took a ride today that somewhat mirrored the ride posted for Tuesday the 13th. Only difference it was about 20 degrees warmer. We checked out the Red Arrow east side long loop and found everything nicely groomed. Then up the 100 Miler to the Lily cut off at Ada Lake Road and over to Lily. Again we found freshly groomed trails all the way. Some of the riders had not been in the Crocker Hills before so we took our time going thru that area and stopped at the old Fire Tower landmark. Then south to catch the Wolf River Trail south to White Lake and lunch at the Black Bear Inn. Great lunch and then we headed back to Townsend via Fish Hatchery Road, Saul Springs Road and the Bob Kroll Memorial trail. Across Reservoir Pond and the Townsend Flowage to home. 88 wonderful miles of riding today. If you are riding this weekend be sure to come to our Bonfire in the Woods event. Details at the top of the home page. January 14th Wed Another great ride today with the same group as yesterday. We made 130 miles and the trails were really groomed. Started out at Townsend Shell and headed north on the grade to LMT 2 and then took the water tower trail into Wabeno. Up the grade a ways to Bushaver Road west and then on the 100 Miler up past Johnnies and hit the grade again north of Laona. Then straight north to Tipler and the White Tail Inn for lunch. We went this way as the grade (Nicolet Trail) is getting thin in some spots and the woods trails were nicely groomed and had more snow. Great sandwich as usual at the White Tail and headed for home. We were going to go home thru Arrogonne but was getting a little late so straight home on the grade. If you are riding the next few days I would get off the grade as much as possible south of Laona. From there north there is plenty of cover but some gravel stones are starting to show south of there. Very smooth all the way…just irritating to see the stones creeping up. Anyway come on up and have some fun. January 13th…Tues Took a 85 mile ride today with Ron Popp, Gary Wagner and Jim Wisneski. It was -16 at 6AM so we waited until 11AM to take off from Townsend Shell. By then it was about +10 so not too bad to ride. We started north on the Nicolet Trail up the 100 Miler Red Ball and then over to Lily. Up past the Lily Clubhouse we went into the Crocker Hills and as usual it was a beautiful scenic ride. You have to ride those hills at least once this season. Then back down the Wolf River Trail to White Lake for lunch and a chance to warm up. After lunch we headed back across the bridge at Langlade and east on the new direct trail along Hwy 64 to Fish Hatchery Road. Back on Red Arrow Trails we headed for Animal’s Bear Trail and back over to the Nicolet Trail and home to Townsend. About 85 miles on the clock. All trails were really great except the trail from Animal’s over to the Nicolet Trail had not been groomed since the weekend. Not real bad but not as good as what we rode on the rest of the day. The cold conditions are holding the grooming base in place and it should be good all week up here. Come on up and ride! January 10th… First real ride of the season checking out all of the Red Arrow Trails and putting up Fish A Ree posters and trail maps at the kiosks. Trails are a little loose from the fresh snow but very smooth except for a few truck ruts and stones in the woods. Rode about 65 miles and was lots of fun to be out again after a layoff due to extreme cold. January 8th…Wow is it cold. Had planned on riding today but called it off because of cold and blowing snow on the way. Reports from area trail grooming folks and riders indicate that trails are in pretty good shape but we need some more snow to really get things in the shape we now expect. Stay Warm!!! January 1st and 2nd…Friday the 2nd was devoted to the grandkids. Even though it was colder than yesterday we spent 3-4 hours outside sliding down our hill and giving grandkids rides on our two-up Venture. Both Eva and Mason (the older two) “want to go fast” and it was a joy for Grandpa (me) to share my love of snowmobiling with them making big circles on our lake. Next time they visit they want to go out on the trail. Saturday morning son-in-law Troy and I put on about 50 miles checking out the Red Arrow trails down towards Saul Springs road (trail to Animal’s Bear Trail) and found them much better after grooming the previous night. Can’t wait to go for some all day rides. January 1st, 2015…Rode about 40 miles yesterday with son-in-law Dave Stankewicz checking out the Red Arrow and Paul Bunyan trails. The east side of the Red Arrow trails were in great shape and we met the Red Arrow Ultimate out going across them again. Also met the 100 Miler groomer on the grade just across from the Valley Inn so the trail all the way to Mosquito Lake Road was in fine shape (both clubs groom this section). The Red Arrow trail down to Pine Tree was rather bumpy as the truck ruts from deer hunting are not all filled in yet. Turned towards Lakewood at Cathederal Pines Bar/Grill and those trails were smoother as they are mostly on unplowed roads. Back to Townsend via the trail that comes out behind the Shell Station and home across the Townsend Flowage. Cool first ride!!! Today we spent the first part of the day giving the four Grandkids snowmobile rides on the lake in the cutter and then on our sleds. What a great feeling to have them really enjoying buzzing across the lake with Grandpa!. Then Dave, our daughter Kristin and I took about a 50 mile circle down the Nicolet Trail, over to Maiden Lake and then down the Paul Bunyan and Chute Pond Trails to near Animal’s and back over to the Nicolet Trail on Corridor 16. Back to Lakewood and then across the flowage with about 60 miles on the clock. We had stopped in Lakewood to pick up Pat Comerford who was a grade school friend of Kristin. He and his family have a cottage out near the golf course and Pat and Kristin lined up the ride. Lots of fun showing Pat some new trails to the south. December 30th…Picked up my two up Yamaha Venture at Lakewood Motorsports after it got it’s annual tune-up and got to ride it home. The Nicolet Trail (grade) is in very good to excellent condition from Lakewood to Townsend. The Townsend Flowage has some wet spots but seem to be water on top of solid ice. Put the pedal down and pulled into the cottage with no issues. December 29th, 2014 Trails finally opened for the season yesterday and can’t wait to get out and ride this week. With two back to back wet snowfalls the trails should be in pretty good shape for New Year’s weekend. Still some ruts in the woods and water/ice in the low areas so be careful ride sober. See you on the trail!! November 19th, 2014 Here we are with my first post of the 2014-15 riding season! Excited as we have early snow and a new web site to work with. Really looking forward to getting out on the trails but guessing that the Forest Service will not allow us to open up before the 1st of December at the earliest. usually it is about the 10th of December due to deer hunting and making sure the ground is frozen underneath. In the meantime I will be getting my new 2015 Yamaha Vector long-track and spend some time getting it ready for the riding season Feel free to weigh in at the e link above. 3/6 Short 40 mile ride today to check things out for the weekend. Went down past Beavers and took the Bob Kroll to Saul Springs and the got on our “superhighway” to Animals. 10 miles of wide, fast riding. Go right at Saul Springs Road and turn right at the T until you get to intersection and turn left (south) to Eickhoff…take a left and motor on to County T and south to Animals Bear Trail. Believe me this is the trail to take if you want to get the carbon out! Only three weekends left to the season so need to make some miles!! 3/5 Ron Popp and I rode up the LMT groomer garage in Wabeno today to meet up with some LMT members to ride with. Took our outer loop to get some Forest Service Road numbers for funding ATV trails and then up the grade to meet the guys. We worked our way south by coming back down to the Valley Inn and then took the Bob Kroll Memorial all the way to Animals bar at T & 64. Stopped for a bowl of soup and then south to Chute Pond via Blue Spruce and the “tunnel trail” on the Bonita grade. Back up to Lakewood where I dropped off for a stop at Lakewood Motorsports. Greg Weyers offered me a ride on his new Viper “Yamacat”….how could I refuse! What a machine for the hot trail rider. Handles like it is on rails and the 150 HP 3 cyl motor from the Nytro refuses to stop pulling…I got off the throttle at 80 and it was just winding up. More sled that I need but if you want to go fast and have precise handling this is the ticket. Got home with about 90 miles on the speedo. 3/4 Ron Popp, Larry Market and I put on 160 miles today with a great ride north. We took our outer loop and Wildwood Trail to LMT 2 to the Water Tower Trail to Wabeno. Then to Roberts Lake via Bushaver Road and then the 100 Miler north to Cavour. The LMT trails were freshly groomed and awesome. 100 Miler had not been done yet but word was they were out Tuesday touching things up. Once we hit the Nicolet Trail we motored north to Long Lake for lunch at Grandma Sally’s right on the trail. Very good food at decent prices. Talked to the 79 year old Arctic Cat dealer from Laona who was riding alone from his shop for lunch. He is “still going strong” and an inspiration for us slightly younger guys to keep riding. Then we headed south to the Arrogone cutoff that was groomed this morning. About half way to Arrognne the low fuel lights came on Larry and my sleds. Longest trip ever to the C Store in Crandon. 25 miles with the light on is enough for me. Never ran out of gas and this was the closest call yet. Then back home on the 100 Miler east of Johnny’s Resort south to Bushaver and back to Townsend via the Nicolet Trail. One of the best rides yet! At least 75% of the time we were the first sleds (or almost first) on the new 3-4 inch snowfall Monday evening. This season is just awesome and going down in my mind as one of my best…..come join us the next couple of weeks before the long awaited Spring arrives. 2/26 Just totaled up the miles so far this year……1516 with a lot more to come if the weather holds. 2/26 Mike Jim Wisneski and I rode about 140 miles today in some really cold weather. It was 5 below zero when we took off at 9AM for Armstrong Creek. Saw a wrecked Dodge truck in the woods just east of Wabeno but no one there so we moved on. Rode thru Armstrong Creek and headed north to the Nicolet Trail and then west to Arrognne for lunch. Another great place to eat and then back to Laona and Townsend. We did not stop for gas once so the low fuel lights were on by the time we got back about 3PM. A little shorter ride than yesterday but just as good for trail conditions. The riding was unbelievable good even if it never got above 5 degrees. 2/25 Mike, Bill and I topped yesterdays ride with 190 miles on the clock. We started early and headed north for breakfast at the Double Buck in Laona. Great food. Topped of the tanks across the street at Shell and then a fast blast north on the Nicolet Trail to the Michigan border and doubled back to the White Tail Inn where we again topped off and hit the trail west towards Three Lakes. At the cutoff south to Hiles we shot the breeze for awhile with some guys staying in Three Lakes. They said the trails that way were as good as what we had been on all day so far. Believe it or not we ran all that far without a single bump on the trails…Awesome. Headed south to Hiles for a mid afternoon lunch at the Pine Tree. Good food and entertainment by a group of gals who have been meeting there weekly for 35 years to shoot pool. Lots of fun going on. Then on to Arrognne and Laona and a fast trip home on the Nicolet. This all from 8:30AM till just after 5PM. Awesome day and I would say one of the best ever on a snowmobile. 2/24 Brother Mike and our friend Bill Kelley made the biggest ride of the year today. We started out with friends Dale Ott and Ron Popp. Took the outer loop to check out Dale’s grooming work last night….all agreed the trails could not get any better…thanks Dale and all the other groomer drivers. Aborted the idea to go to the Crocker Hills at the Langlade county line as the usual pristine trails had not been groomed yet and it was really bumpy. Backtracked and headed south on our trails past Animals and again took the “tunnel” south to Chute Pond. Back to Paul Bunyan trails and a big loop around behind Waubee and back to Townsend with about 110 miles on the clock. Gassed at Townsend Shell and Mike, Bill and I headed north to LMT 2, the 100 Miler to Johnny’s Resort, over to Laona and back home by 5:30 with 161 miles total riding for the day. I have to say that all Red Arrow, Paul Bunyan, Chute Pond, LMT and 100 Miler trails were in as good a shape as I have ever seen. All trails we rode were either groomed Sunday night or early Monday with a couple of groomers still out Monday during the day. Great job guys and THANK YOU for your efforts. 2/22 & 23 Family weekend at the lake with Kris, Dave their kids and friends James and Betsey as guests. We rode Saturday about 75 miles with a trip up the Nicolet and outer loop to the Valley Inn and then south past Animal’s Bear Trail (quick stop there for a drink) and then south to Chute Pond via the “tunnel” and back up the Nicolet Trail to Mountain where the Chute Pond club was having a trail side cookout. Stopped for a brat and cheese curds. Told them how good their trails were today. Then north to Paul Bunyan trails over towards Waubee Lake and the ski hill. Looped around back to Townsend…awesome ride!!! The kids rode about 50 miles on Sunday around Townsend and Lakewood and said that despite the warmer weather trails were holding up well. Kudos to Red Arrow, Paul Bunyan and Chute Pond groomers for keeping the trails in such good shape with the warm-up and huge number of sleds out for the weekend. 2/20 Dale and Mike Ott, Mark Bies and I headed up the Nicolet Trail today and took the LMT cutoff to Armstrong Creek. Some stutter bumps on the Nicolet north of Carter but not bad. Once we hit the woods both LMT and the 100 Miler trails were awesome all the way to Armstrong Creek. Had lunch at the Green Shack…big food for small prices. They are a big booster of snowmobiling so stop in if you get up that way. Due to the incoming snowstorm we came back the same way except we took the 100 Miler all the way into Wabeno…it was freshly groomed and great condition. Then back to Townsend on the Nicolet for about 90 miles total for the day. Again nice and warm but no sun today making riding conditions ideal. 2/19 Great ride today with the first stop for breakfast at the White Lake Cafe (takes about 1 hour 15 minutes from Townsend). Jim Wisneski, Ron Popp and I met Dan Gundert and his son Dylan from Chute Pond as well as Larry Market who drove over for breakfast. Andy Kostelny from White Lake was a no show but the breakfast was great. We made a big loop just up the Wolf River Trail west and wound up back at the Lily Club house a couple of hours later. Then back towards Carter and Townsend. All told a 125 mile day with almost 100% great trails. The weather was warm but the trails held up great. Good not to be in zero weather for a change. 2/13 Second day in a row for some great riding. A group of us went up to Post Lake in Langlade County for lunch at the Post Lake Inn. Really good soup and sandwiches. About a 60 mile haul each way but easy with the trail conditions. For the second day in a row we had superb riding….this time courtesy of LMT, !00 Miler and Pickerel Tombstone. Thanks guys for the great trails….we really enjoyed the ride with the fresh snow falling most of the day. 2/12 Finally back on the sled after two weeks with the flu. A real bummer as the trails have been great. Some club members put on about 75 miles with a trip over to Jungle Jim’s in Silvercliff. Great food and the trails were great all the way. Hats off to Paul Bunyan Riders and Iron Snowshoe for the great trail conditions. They just can not get any better. 1/24 First time on the sled this week and what a joy it was. Our kids are up for the weekend and took my 6 year old Granddaughter Eva on her first ever real ride with me. Her Dad Dave and I took the loop out towards the air park and back around to Townsend with Eva in front of me. Got one of those harnesses that strap the child to the operator and boy did it work great. No worries about falling off or hitting the handlebars or windshield. Eva’s fingers getting cold were the only thing that stopped her from riding a lot further. Need to fix that with some real snowmobile gloves. Days like this make life a real joy!!! 1/18 Our club Bonfire in the Woods was today. Took a quick ride out to the event to help set up and then back to the cottage to pick up Linda to attend the event. Very nice day and lots of folks stopped by. Thanks to Clint Aderholdt for organizing the event and Jeff Kroll for bringing out the firewood. There are photos posted on the Prior Events page link Just click the link to hop over to the photos. 1/17 My brother Mike came up today on a “day trip ride” and was not disappointed. The Red Arrow trails are great…freshly groomed and getting packed down after snow on Tuesday, Wednesday and Thursday night. We rode the entire east side and it had just been groomed Thurs day night and was awesome. Then we took the Bob Kroll Memorial down towards Langlade County. The snow is a little less packed on the west side but still nice and smooth. Understand the groomers will be out all weekend on our entire system so things should get even better. We took the bridge at Langlade to the Wolf River State trail and rode all the way to Crandon on it. Stopped for gas and lunch and then headed east to catch the Nicolet State Trail at Cavour. We were running early so we decided to take the old trail to Cavour and up and around to where it reconnects with the NSRT and then a quick blast home thru Laona. Watch your speed in Laona as the police were running radar on the south end of town just north of T Bobs. 10MPH seems really slow but better than a ticket. Back to Townsend with 130 miles on the clock. It could not have gotten much better!!! We are so lucky to have true up north riding less than two hours from Green Bay/Fox Cities. Hope you all come up and enjoy things with us. 1/15 AWESOME FRESH SNOW!!!! We got nearly 10 inches of fresh snow yesterday and Larry Market, Jim Wisneski and I took full advantage. We took off from Townsend Shell at 10AM and headed north on the Nicolet Trail thru Carter and Wabeno..groomed and in great shape. Then we took LMT 8 over towards the 100 Miler and Johnny’s Resort. LMT 8 was not freshly groomed yet but still very rideable. The 100 Miler trails were all freshly groomed and in great shape. We crossed Highway 8 and headed for Crandon and then south on the Wolf River State Trail. The LMT groomer was headed south ahead of us and doing a great job. Once we passed him it was quite bumpy until we got into Langlade County where the groomers had already been out. Stopped in White Lake for lunch and then headed back towards Boulder Lake. Those trails were all freshly groomed. Next over to Animal’s Bear Trail via the Chute Pond trails…again freshly groomed. From Animal’s back to Townsend we saw that the Red Arrow groomer was busy at work. Never did see him as there are several loops but the trails were very good. All areas need to be groomed multiple times to get fully packed down but considering it was the day after the big snow I think the clubs are all doing an awesome job!!! 125 miles…much of it on trails that we were on first. A great day to be a snowmobiler. 1/10/2014 Got out for a ride today to help survey our entire trail system. Club President Joe Kampf, Vice-President Larry Market and I rode the entire west side of our trail system to inspect it for condition and any hazards. we put on a little over 50 miles with a stop at Animal’s Bear Trail for lunch. As usual Mike (Animal) was serving great soup and we all enjoyed a bowl. Fresh snow expected tonight and Joe says the groomers will be out in force. Hope to get some more riding next week. Our grandsons birthday party Sunday will limit the riding to running around the Townsend Flowage but future snowmobilers are being groomed to enjoy the sport. 1/4/2014 Finally had a chance this week to get out and ride!! On Thursday Jim Wisneski and I went out scouting for some new ATV trails next summer in the Town of Doty Area. We found that there is better snow on the west side of Hwy 32 especially to the southwest of Townsend. The trail south from the Valley Inn was fair to good as far as Saul Springs Road and our “highway Saul Springs Road” has lots of snow but needed grooming. A quick call to club president Joe Kampf got a commitment to handle that on Friday. Overall we rode about 60 miles on Red Arrow trails and found things in good early season condition. On Saturday (today) I took Bill Weyers from Iowa down that same way and was very pleased to find Saul Springs Road in great shape. Pat Harrison had groomed it Friday and it is now AWESOME. We used it to connect to Langlade and Wolf River State Trail. They have had more snow over that way and trails are very good to excellent all the way to Lily. Had lunch at the Lilly Club house and then headed back to Townsend via the trail east that connects into the old “Red Ball” now called the 100 Miler. This too was very good all the way back to Townsend. Only a few spots with truck ruts so be careful. Great day to be on the trail and 75 miles on the clock. Bill is the son of long time club member Jim Weyers and he truly enjoyed our ride. Friday March 22nd…..Got to ride one more time today but this is it!!! Jim Wisneski and I took off from Townsend about 9AM and took the outer loop and Wildwood trail to the Nicolet Trail and north to Wabeno. Got on the 100 Miler northeast to Armstrong Creek and then over to Goodman. Got on the Pipeline south and had lunch in Silver Cliff at Jungle Jim’s….awesome sandwiches. Then came west back to Lakewood and Townsend via the Air Park. Got home with 112 miles on the clock and memories of great trails all the way today and the best 6-7 weeks of snowmobiling ever. Despite a late season start (Feb 12th) due to surgery I managed to ride just over 2000 miles. Thanks to all the efforts by all area clubs who did a AWESOME job this year once the snow started coming….it will truly be a season to remember. Friday March 15th….Probably the last ride of the season for me due to other commitments. That does not mean the season is over if you want to come up and ride. Joe Harrison and I went for a 95 mile ride today and there is lots of base and the clubs in the area are all grooming. We started with the Red Arrow Outer Loop and then up to the Water Tower Trail and then headed north on the 100 Miler up to Johnny’s Resort and over to Laona for gas. Took the Nicolet Trail south to the LMT trail west towards Armstrong Creek. At the T back to Wabeno we talked to some guys who had come from the east and they said the Marinette trails and back to Waubee Lake Lodge were all in very good shape. Back to Wabeno and onto the Nicolet Trail. I showed Joe the overlook just across from the Valley Inn. Red Arrow cannot always make it up the steep hill to groom but right now it is in good shape to get to the top. What a view as you can see from the photo above. Turn right at the stop sign just after you cross Hwy 32. If you see more reports that means I got to ride a time or two…if not time to get out the ATV and switch gears for the summer season. What a glorious February and March for riding….many say the best trails ever throughout the area!!! Wednesday March 13th…Jim Wisneski and I went on a 110 mile ride that will go down in history as the best ever!!!! We took off from Townsend and went around the outer loop and Wildwood Trail up to Wabeno. Then we cut across to the “Water Tower Trail” and took it down to where it connects with the 100 Miler over to Ada Lake road and thru the woods to Lily. Past the Lily clubhouse thru the Crocker Hills (full of snow covered pines and scenery) and then down to White Lake for lunch. At that point we were on the trail for 2 1/2 hours and had 65 miles on the clock!!! Our Yamahas were biting the hard pack better than I ever remember….awesome. From White Lake we went across to Boulder Lake and worked our way back north to Townsend on Red Arrow Trails. Everything was freshly groomed the sleds were hooking up the best ever and we were back in Townsend in less than 5 hours total with the sweetest ride ever in our memory bank…hope there is more to come yet this year. Thursday March 7th…Larry Market, a very active club member, and I met Joe Kampf at the Shell station just before 9AM. Larry was a long time snowmobiler but had not ridden in “at least 10 years” as he and his family prefer summer ATV & UTV riding. Larry borrowed one of my sleds and the three of us took off and covered almost every inch of the Red Arrow system. According to Larry the trail layout looks pretty similar but these days the trails are brushed out much wider and groomed far better than back in his riding days. We rode down to Animal’s Bear Trail for a pit stop and then back to the Shell station. A total of almost 70 miles. Both Joe and Larry really enjoyed the ride. The three of us all agreed that the Red Arrow System is in the best shape ever. And since we came across the Paul Bunyan Cathedral Pines trail we said the same about their trails. It’s not too late….come on up and ride!!! Wednesday March 6th… a fellow club member and I took off about 9AM for Post Lake. Took the 100 Miler and then the trail to Lily and lots of other trails all the way to Post Lake. Saw ONE sled all the way and every mile of trail was freshly groomed…I kid you not. The same held true coming back on the other side of the Wolf River down past Mole Lake and the Wolf River Trail and back to Townsend…no traffic…Awesome trails and about 125 miles on the clock. Oh, bye the way, lunch at Al and Diane’s in Post Lake was great….huge homemade sandwiches. What a great ride as the season is winding down. Tuesday March 5th…took a quick 50 mile trip south around the Paul Bunyan system past Maiden Lake to Halfway Bar and out past the old ski hill and up Wildwood Trail back to Townsend. AWESOME is the word. Trails were in great shape and a joy to ride. Friday March 1st…Awesome ride today!!! Three of us took off at 9AM from Townsend Shell north and started with a fast trip around our outer loop and Wildwood Trail. Just groomed last night…flat and fast. Then up the Nicolet Trail north of Laona to the cut off to Arrogone. The Nicolet was in about as good a shape as I have ever seen and the trail to Arrognne was great too. I love that trail when it is freshly groomed. Reminds me of the racetrack at Elkhart Lake…lots of gentle sweeping turns with a few sharp corners to keep you focused. We were in Arrogone by 11:00 so decided to skip lunch there and head to Crandon for gas and lunch at Frog Alley. Oops…they don’t open till 2PM so we took the trail to Windfall Lake and had lunch there. A quick trip back to Townsend and my Yamaha was in the garage by 2PM with 135 miles on the clock for today. Not a bumpy trail all day…there is no question this has been the best season in years for riding. All the clubs are doing a great job of maintaining the trails….now if it were only January instead of March!! Thursday Feb 28th…Wow the last day of February!!! Ron Popp and I got a late start (about 12:30) and rode up to the scenic overlook across from the Valley Inn. Very pretty but bumpy to the top so Ron is going to groom this access trail tonight. Take the time to go up there this weekend. The Forest Service cleaned all the new growth away this summer and on a clear day “you can see forever”!! We backtracked and went up to Wabeno and cut across town to the “Water Tower Trail” down to the 100 Miler. This is a very pretty trail that does not get a lot of use because you have to cut behind the ball field and ride the town road for one half mile but then….awesome!!! The LMT guys we met said it is scheduled for grooming Friday night but it is great right now. We swung down the 100 Miler and rode Ada Lake Road and Diamond Roof Road to the new access trail over to 9 Mile Resort. Both roads are posted snowmobile routes but be careful as they are icy covered by a light dusting of snow. Then down to our Red Arrow Trail and a loop home past the Valley Inn. A quick 60 miles in about 2 1/2 hours made for a great afternoon. Wednesday Feb 27th…Our plan for the day was to go up to Florence via the Nicolet Trail and Corridor 6 east. All went well until we got to the split for Pantoga and Florence. The groomer had turned around there and Corridor 6 was very bumpy. We rode east about 5 miles and then decided there were smoother trails elsewhere and we turned around and back to the intersection with the Whitetail Inn. At that point some of the guys decided on the very long loop thru Three Lakes and Arrognne. I headed straight back on the Nicolet Trail to Townsend due to a commitment. It was a great 125 mile ride for me and the rest of the guys logged near 200 miles of reportedly smooth trails. Saturday Feb 23rd….rode around the Red Arrow trails with my video camera this morning. About 25 miles of riding and some great video of snow covered pines and lots of riders enjoying the fresh snow. Hopefully I can figure out how to post to You Tube soon. Friday Feb 22nd….Plan was for several groups to converge on the Lily Sno Birds club house for lunch. Long story but with the heavy snow some of the group did not make it and others had to leave quickly for some evening activities. Jim Wisneski and I wound up meeting and riding with Joe and Jason Harrison who are Red Arrow members but we had not ridden with them before. Had a great ride in the falling snow thru the Crocker Hills , down to Langlade and over to Boulder Lake. Met two Chute Pond club groomers at the 4-way intersection on Blue Spruce and took some photos of them. Great to see all the clubs doing such a great job grooming. We headed back to the Nicolet Trail and home with memories of one of the prettiest rides of the season. If you have not gone into the Crocker Hills (behind Lily Sno Birds club house) you have to do it. Ten miles of gorgeous scenery including a view of one of the few remaining fire towers. About a 85 mile ride as we took our time enjoying the views. Thursday was supposed to be an off day but I decided to ride around the Red Arrow trail system and pick up Fish A Ree posters from our kiosks….a very pleasant 55 mile jaunt in about 2 1/2 hours. Wednesday February 20th…3rd day in a row for riding. A group of Red Arrow members including me took off with the idea of heading for the Lily River Lodge for lunch but found it closed. So on to Pickerel Lake for a stop at the Final Lap and some great burgers and chicken sandwiches. After lunch we made a big loop up the Wolf River Trail and over towards Rolling Stone lake and looped up to Crandon and back down to the Nicolet Trail via Cavour. About 120 miles of smooth trails…great day of riding. Tuesday February 19th…A group of eight of us took off this morning for a ride despite the cold and wind. We like the outer loop so took it again today and around to the Valley Inn and down the Bob Kroll to Langlade County and on to Langlade and the Grudgeville Pub for lunch…great food and we learned how the place was named (go and find out for yourself). Then we doubled back and on to Boulder Lake and then north to Lakewood for a stop at the newly reopened Rawhide (soon the T&T Russted Nail….yes that spelling is correct) for a soda and then took the Cathedral Pines trail home. Seriously….over 70 miles and not a bump. The trails are awesome right now and all clubs groomed last night or this morning. Kudos to Paul Bunyan, Boulder Snow Goers, Chute Pond and of course our own Red Arrow team….great job guys!!! Monday February 18th….Today seven of us took a high speed blast up the Nicolet Trail to the White Tail in Tipler. We started out going around our outer loop on the east side and it was awesome. Red Arrow groomers have been out every night since last Wednesday and it shows…thanks guys!!! Then it was straight up to Tipler with only a couple of short rest stops. A great lunch and straight back home. Overall about 130 miles of flat out fun. The trails were smooth all the way so thanks to the Forest County and Florence county clubs for a great job Sunday night after a very busy weekend!!! Hope to ride every day this week!! Thursday February 14th….What an awesome ride. Rode with 4 friends today as three inches of fresh snow was coming down. Took our long loop around to the Valley Inn and then up the 100 Miler to Windfall Lake and on north over to Roberts Lake and on south of Lake Lucerne where we picked up the Wolf River Trail south. Only one other sled ahead of us on the fresh snow and it was “pedal down” all the way to White Lake for lunch. We ate at the Black Bear Bar & Grill and as usual the food was great. The owners are great supporters of the snowmobile and ATV sports. We headed back east towards the old Fish Hatchery on the Boulder Lake trails and picked up our new Saul Springs connector for the trip home to Townsend. With the exception of an area just before we hit the Wolf River Trail there was not a bump in sight. With temps in the mid 20’s and fresh snow coming down you could not have had a better day for a ride….come join us!! Wednesday February 13th…Carotid Artery surgery went well…cleared to ride today. My friend Jim and I took about a 100 mile ride today. My first time on the sled in a month. We started out in Townsend and took the long loop around to Wildwood trail and the Nicolet Trail down to the Valley Inn. Then up Mosquito Lake Road and down the Bob Kroll to Animal’s Bear Trail. Great riding as the groomers had been out last night and most areas were smooth and fast!! Then we headed south to Chute Pond via Bonita. They must have had more rain down there as the trails had some icy spots but very well groomed. Back up the Nicolet Trail to Lakewood and over to the Sand Trap for lunch. Then back to the Nicolet Trail and home. Overall a great first ride. With a couple of inches of fresh snow things should be really good for the weekend. Thursday January 3rd….Rode about 300 miles over the New Years weekend and today. Mostly around the Red Arrow and Paul Bunyan systems. Trails including the Nicolet Trail are in great shape wherever there is a firm hard base. Trails in the woods are getting thin and we need more snow. The Saul Springs Road/Eickhoff Road loop is awesome!!! About 10 miles of riding from Animal’s Bear Trail (Hwy T & 64) north towards Townsend is smooth and fast!!! Pretty good overall report considering the amount of snow we have gotten. Langlade County Trails open Friday at 5Pm so that should make for some nice riding to the Wolf River Trail and the Crocker Hills/Lily area. Bottom line….come up and ride if the temps don’t get too warm. Saturday December 29th…Yesterday we rode about 75 miles and covered our whole system checking things out. Trails are in good shape but could use some more snow. Thin spots in the woods and some ruts not filled in….suggest you are very careful. We stopped at Animal’s Bear Trail and i had a bowl of Split Pea soup….awesome!!! After a no snow season last year Animal’s was busy…good to see. Today I rode about 35 miles around town and the east side of our system. Lots of sleds and two inches of light fluffy snow made for a very pleasant ride. Kids and grandkids up for the weekend so expect to do some short trips around the area. See you on the trail!!! Saturday December 22nd…I’m happy to report that the trails are open and I took my first ride of the season this morning. Two friends and I rode about 75 miles on the Red Arrow, Paul Bunyan and Chute Pond trails. We put up Fish A Ree posters at all of the club kiosks and found the trails in surprisingly good shape. There are some places in the woods that have ruts showing but for the most part I would rate the trails good to very good. The same goes for trails south but the snow is a little thin south of Mountain. Our trail boss Jeff Kroll said the groomers will be running regularly from here on so things should get even better. Merry Christmas to all who visit this page. If I get enough interest we are talking about another tab for “rider reports’ including photos. We ask that you e-mail me at jbrantmeier@athenet.net if you have a report and/or photos. We ask that reports be limited to riding trips originating or ending in the Townsend-Lakewood area. our goal is to post the reports so that others can get a good feel for the great riding we have up here. Thursday August 2nd….550 miles year to date….On Monday July 23rd Jim Wisneski and I rode over 140 miles to Mole Lake and back. We took the Nicolet Trail north to Cavour and then west on County Hwy O (mostly gravel) to Margie’s Road and Sring Lake Road to the area of Johnnie’s Resort. Then we took Bradley Lake Road and turned right on some well signed roads to the Wolf River Trail. From there it is about 5 miles of blacktop to Mole Lake. We could have gone to Crandon or Lily instead and stayed on the gravel (next time). Only problem is you have to backtrack the same way…no loop yet. Yesterday August 1st I joine 9 other riders to explore the Roberts Lake area. You get there by going north on the Niclolet Trail to north of Wabeno and turn left at the Roberts Lake marker (Bushhaver connector and road). Make sure you turn left at Roberts Lake Road (not marked well) and continue around the bottom of the lake via roads and some trail to McArthur Trail. Hopefully soon there will be a connector from this area making a loop with the ride above but for now we backtracked and came back to Townsend the same way. Great fun and a nice lunch at the diner in Crandon (just opened under new owners but only open till 1PM so we just made it). Sunday July 15th…had a few chances to ride since June 13th but no time to update this side. Went around the big loop to 9 Mile and Animals on Wednesday of this week with Jim Wisneski. This trail is now 100% dirt or gravel from Barb’s Valley Inn to 9 Mile and a great ride. You get to dig around in the dirt (some mud) after you turn off Diamond Roof Road and take the “true trail about 5 miles right to the back door of 9 MIle. Thanks to the White Lake ATV Club for a great job on this new section…lots of effort with the Forest Service to make this happen. We went on to Animals and back around to Townsend for about a 60 mile loop…great time. PS: 9 Mile has great food and gas… Wednesday June 13th…Jim Wisneski, myself and a friend of Jim’s took the Nicolet Trail up to Newald and turned left on Double Tree Road towards Argonne. The gravel roads are pretty well marked with ATV route signs but suggest you get a map. We rode into Argonne about 1PM and had lunch there. Also got gas just at the edge of town on Hwy 32/55 (legal trail to get there). From there we took the marked route back towards Cavour via Marges Road (among others) and interesected the Nicolet Trail to head south. Note: we were only about 2-3 miles from Johnnies Resort but did not have time time to stop. Headed south and home on the Nicolet Trail. This was a great 100 mile or so ride that took about 6 hours with a 45 minute pit stop for lunch. Easy riding if you want to see some scenery and not a lot of mud. Only a few miles of blacktop…overall a great day to be on the trail. Wednesday June 6th…took the “outer loop” on the Dusty Trails system and came back thru Crooked Lake to Townsend with Jim Wisneski and friends. This is a great 5-6 hour ride. We accessed the Dusty system at Breed from the gas station. A couple of miles of blacktop and then lots of great sand riding all the way back to Crooked Lake. Wonderful 75 mile or so ride. Tuesday May 24th…Ron Popp, Dale Ott and I took the new trail to 9 Mile Resort today. We took the Nicolet Trail up past Barb’s Valley Inn to Mosquito Lake Road to Diamond Roof Road (all gravel) and rode several miles (just before Sawyer Lake Road) and took the brand new trail to the right…it is clearly marked. This trail runs thru some light mud (when wet) and lots of sand all the way to 9 Mile…no more blacktop on Sawyer Lake Road. Lots of fun thanks to the White Lake ATV Club and the National Forest Service who sited the trail. 9 Mile has great food and gas so it should be a popular destination as the word gets out. Came back to Townsend the same way due to time issues but could have gone south on the trail/route to Animals and back to Townsend via the Nicolet Trail. This would be a 5-6 hour 65-70 mile ride and a great ride with only a mile or so of blacktop. For us it was about a 45-50 mile trip and a great day Saturday May 5th…a bittersweet day. Six club member ATVs took the new riding loop to Animal’s Bear Trail with about 50 other riders to dedicate a sign on the trail at Animals to Roger Steinbach. Roger passed away unexpectedly last fall…he was very active in many area clubs and will be sorely missed. Led by the WATVA staff the group had lunch at Animals and made the 50 mile loop in Roger’s memory. Tuesday May 1st…Today was opening day and 10 of us went for a ride including the four trail patrollers listed. We found a few trees down but the trails were in generally good condition. It was opening day but we only met about 10 other ATVs and UTVs all in small groups. We did a “dry run” of the Roger Steinbach Memorial Ride this coming Saturday with a side trip to 9 Mile Resort for lunch. Starting in Townsend we went south on the Nicolet Trail to the trail to Animal’s Bear Trail and then proceeded north to Sawyer Lake Road and 9 Mile Resort. After lunch we went back to the Nicolet Trail in Townsend but took the Wildwood Trail around the back of Townsend and then looped back north to the Shell Station and home. About a 65 mile round trip…great to be on the trail again. Wednesday April 4th…Well here we are with the first ATV UTV season post of the year. I am pretty excited about the season as we just picked up a new 2012 Polaris 550 Touring yesterday. The Townsend town roads are open so hopefully I will get a chance to break it in before the season starts May 1st. In the meantime lots of yard work along with getting the trails ready to ride….see you back here soon with some riding reports. Wednesday March 7th… A couple of club members got up early and rode to the Fence area and back for about a 140 mile ride. I had hoped to go along but the flu bug has got me down. With the 50 degree temps the riders reported a great trip up but slush and bare spots on the Nicolet Trail coming back home about noon. Most locals have thier sleds parked until it cools down and we get some more snow. Tuesday March 6th…No riding over the weekend and Monday due to family commitments. From rider reports I missed some of the best riding ever in the Townsend area. Visitors must have agreed as there were literally hundreds of trailers parked at the usual spots. 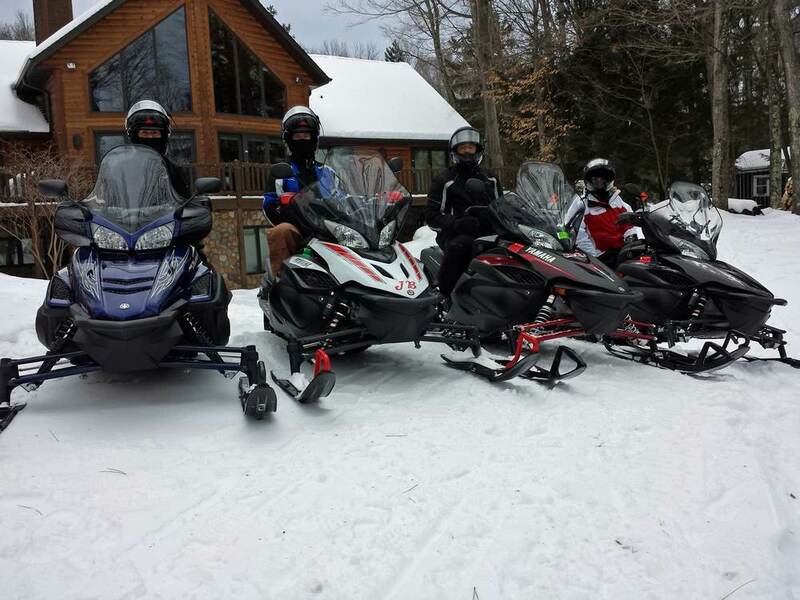 Club members and groomer drivers reported record numbers of sleds on the trail and at the local stopping places. Thanks big time to all the groomer drivers who worked every night from Wednesday thru the weekend to get the big snowfall (20 inches plus since Tuesday evening) packed down and groomed the way riders expect. Thanks also to all who visited our area and the Red Arrow Snowmobile ATV Club members who contribute in all kinds of ways to our great trails. Postings will be less frequent going forward as March is really busy for me and the riding opportunities will be few and far between. Cross your fingers that the 40 plus degree temps and rain forecast don’t ruin all the great trails and you can keep riding!! 1661 for the year so far Friday March 2nd…Jim Wisneski and I rode about 150 miles today starting at about 7:30AM. We took the grade (Nicolet Trail) straight up to Long Lake. Good except between Wabeno and Laona where it was really rough. Florence County had not groomed yet so we turned around and took the cutoff to Arrogone and was it awesome. The best shape this trail has ever been in for me. Great ride back down to Crandon and then….15 miles of torture as the Wolf River Trail south of Crandon had not been touched since the snow and was rougher than the proverbial cob almost all the way to the Langlade County Line. From there on to 9 Mile resort it was AWESOME!! Some “off road trucks” dug up our trail along Eickhoff Road so we checked out the damage. What a bunch of jerks!! We had just groomed the trail last night…will be going out again tonight to repair the damage. Back home across both flowages (see front page warning about staying off the ice) and back home. A great day to be in the woods. Thursday March 1st….Wow what a storm…local residents say that we may have gotten more inches in the past but never this much wet heavy snow. Most of us spent a day or so cleaning out and getting the trails prepped. We rode about 60 miles today checking things out. Our long loop is great and the 100 Miler is super as well. LMT did not groom LMT 2 yet as of 2PM. We rode the fresh ungroomed snow to Lily and turned around the same way. Wow…lot of fun pounding thru the fresh snow. Saw a rider alone and stopped on the trail so stopped to help…the group went on to the Valley Inn. Took about 15 minutes for the guys buddy to come back and the three of us got the sled turned around and I showed them the way back to Barb’s Valley Inn. Not a lot of fun for them towing a sled thru the heavy snow. Anyway, more riding Friday….come join us! Sunday February 26th…Kris got her turn with me after James and Betsy left early for home. We did the same trip as below except did not go to 9 Mile. Went “over the top scenic route at Saul Springs to potato fields by Animal’s and the turned around and did a loop up the new Saul Springs Road route and back home. About 30 miles in a little over and hour. Great weekend with family and friends. Granddaughter Eva got her first real snowmobile ride for about 15 minutes on the lake when we got back. 3rd generation snowmobiler in the making!!! Saturday February 25th…friends of our kids up for the weekend along with )Kris, Dave and grandkids). Kris stayed with kids while the rest (4) of us made the trip across the two flowages, south to Animal’s, backtrack to 9 Mile the long way as described below including new Saul Springs route and then up to Lily and around past the Valley Inn home. About 65 miles before noon on Saturday. Great conditions all the way!! See photos on home page. Thursday February 23rd…We took Jim Weyers trailer up to Lil Hummers on Hwy A in northern Langlade County today. First time on a trailer in 4 years but we wanted to check out some new areas. The Townsend trails are about the same as reported yesterday. We found about 50% fresh groomed trails and the rest mild stutter bumps and lots of good snow cover. Rode about 80 miles in a loop around Lil Hummers and then ate there…good food. This is also a good jumping off point for summer ATV riding. 1396 for the year. Wednesday February 22nd…Jim Wisneski and I took three guys from the Forest Service staff snowmobiling today. We basically covered all our Red Arrow Trails and then went from 9 Mile up to Lily and back to Townsend. Had lunch at Animals…the trail is great to the potato fields and really thin to the bar but the food was really good. Mike (Animal) can use your business as it has been a tough winter with the trails to the south having little if any snow. Overall a great day as that two inches from Monday is still nice and loose on top of a flat well groomed base. Come on up and ride!! Tuesday February 21st…a group of us rode about 80 miles today starting with the long loop on the east side. We took Wildwood Trail (great…freshly groomed) around to LMT 2 west. This trail was bumpy and could use some grooming. Then took the 100 miler to the Lily cut off and rode over to the trail south just before you get to Lily and down to 9 Mile Resort. This was great all the way to 9 Mile. We took the “back way” out of 9 Mile and headed down toward Langlade but turned around at the Fish Hatchery due to low snow and came back around to the new Saul Springs Road trail and circled back to Townsend. Stopped at Sunset Resort for lunch…great food and Tom the owner is a big booster of Red Arrow. Back home by about 2PM. Club member Jim Weyers rode along with his son and grandson who live in Detroit. Great to see three generations on the trail together. It was snowing most of the time we were riding and the trails are getting better. Should be a good weekend to ride if you are planning on coming up. Sunday February 19th…no riding today with three warm sunny days coming up. The good news is I just saw on Green Bay TV news that we get, on average, 1/3 of our snow from now till the end of the season. If average we have 18 inches of snow coming yet this year….cross your fingers!! Considering the low snow, I just added up a total of 1166 miles of riding so far this year without using my trailer even once. We are truly lucky here in Townsend!! Saturday February 18th…rode about 75 miles again today checking things out around the area. About the same run as yesterday but skipped the new Saul Springs Road part and went south at the T just into Langlade County. At the next intersection I took the trail to 9 Mile Resort and had a nice visit with Lowell and Sheila. Going this way to 9Mile avoided that knarly section I talked about below.. You could go out of 9 Mile the back way and head to Lily but I elected to take Lowell’s trail over to the Wolf River Trail and up to Lily and then headed home east on the trails thru the private forest land (great stretch of trail) up to Ada Lake Road and the 100 Miler to Barb’s Valley Inn and the Townsend Flowage. A very good day with only a couple of bumpy spots. There were not a lot of riders out…missing some great riding up here. Friday February 17th…Jim Wisneski and I started out this morning at 9:00 on what turned out to be a great 75 mile loop in about 3 hours. Follow these directions if you want to duplicate…Note…I cannot endorse riding over frozen lakes so do so at your own risk! We started on the Townsend Flowage and rode to the Red Maple boat landing, took the club trail to Reservoir Pond and then across to the Burndt Dam boat landing. Trucks were out on the ice and no soft spots…you decide if you want to cross this way or take the Burndt Dam road trail south. Either way you go to Beavers, Pine Tree Road (turn left at Carl’s Kiosk) and south to Saul Springs Road. We turned on Saul Springs Road and rode 8 miles on it going south at the new trail (note Saul Springs Road and Rose Lake Road are the same for about 1/2 mile past the bridge) and left on Eickhoff Road to the potato fields. We turned around there and went back up to Rose Lake Road and turned left and then another left down to the Fish Hatchery and again turned around. This was just groomed in the last day or so. Back to Rose Lake Road and straight thru towards 9 Mile Resort and Lily. There is about 1/2 mile here that is really knarly but worth putting up with as you will read. After that stretch the trail was well groomed to the Lily/9 mile intersection. We opted for Lily but the trail to 9 Mile looked good too. It was great all the way to Lily where we opted to go right back towards home. (If you go left expect about 1 mile of cruddy road until you hit town and the Wolf River Trail). it was great thru the woods all the way to Ada Lake Road where you turn left and follow the 100 Miler back towards Hwy 32. We elected to turn left on the LMT and rode about 1 mile to LMT 2 and across Hwy 32 to the Nicolet Trail. A few bumpy and burned out spots but mostly very good. A turn south on the Nicolet Trail and about a mile to Wildwood Trail left and the “Long Loop” back to Townsend completed our ride. I would honestly say that 98% of the ride was VERY GOOD with a little rough here and there and that one bad stretch I mentioned above. If you want to go to Barb’s Valley Inn you can take the 100 miler all the way down and skip the LMT 2 part but we did not ride it. The Nicolet Trail from Barb’s to Townsend is great until you cross Hwy 32…stay in the alternate along the town road and you should be able to make it back to the Townsend Flowage. South of there the grade is shot so gas up at Townsend Shell before you unload. You might ask Terry at Markubys if you can unload in her lot (support her by buying some food or drinks) or at the unloading area across from the Salt Shed on the north edge of town. Things may change if we get warm sunny weather but right now this will work. PS: at 1:03PM it is overcast and light snow is falling! Thursday February 16th…rode about 40 miles today on our west side trails. Main reason was to put Snowmobile Route signs and orange diamonds on the newly approved trail (route) south from Rose Lake Road on Saul Springs Road to Eickhoff Road. This newly approved unplowed road is an alternative to taking the scenic hilly trail to Animals Bear Trail. Go west across the bridge into Langlade County and turn south on Saul Springs and you will come out about 500 feet west of where our current trail comes out to Eickhoff. Great ride and lot of snow cover right now. Most west side trails are in fair to good condition except the unplowed roads that are very very good. Wednesday February 15th…Rode to Post Lake today with 3 other club members. We headed up the Nicolet Trail to Barb’s Valley Inn and took our trail left up to the 100 Miler and then turned south to Lily. The 100 Miler was thin but ridable and the trail to Lily was AWESOME…freshly groomed…flat and fast! At Lily we headed north and the Wolf River trail had some gravel for about the first two miles and then was great up to the Lily River Lodge (now Frog something) where we headed for Pickerel Lake and on up to Post Lake. 99% of the trail was very good to excellent…a few patches of mud along some roads were pretty knarly!! Had lunch at the Post Lake Inn and shot the breeze with Diane and Al the owners…every Wed is “dollar day” so burgers, tacos and a couple of other sandwiches were a buck…very good. We came back the same way with the sun shining. Trails were soft but still in great shape. Overall a great 120 mile ride. We need some fresh snow, clouds and below freezing temperatures to keep things going for the weekend. Tuesday February 14th…First ride in a couple of weeks. We had a great Fish A Ree. Thanks to all of you who helped or attended this past weekend. With 1 1/2 inches of fresh snow last night it was time to ride. Seven of us met at the Kiosk just north of the salt shed this morning and took the short loop and Wildwood Trail to the county line. GREAT!!!! The we went north to LMT 2 and headed west via LMT and 100 Miler trails. There were some bumpy spots but enough fresh snow to smooth things out and provide good lubrication. We headed further west to Pickerel Lake and had lunch at the Final Lap on the lake…very good food. Then we headed back by taking the Wolf River Trail (grade) to Lily. Some stones coming thru near Lily but not too bad. At Lily we headed east and conditions were great all the way to and up Ada Lake Road. Then back on the 100 miler where we headed south to Barb’s Valley Inn and home. A great day with about 95 miles on the clock. Hope we get that fresh snow on Thursday but for now great riding Townsend and north. Wednesday February 8th…no riding in the last week as we got ready for our Fish A Ree this weekend and the warm weather besides. Yesterday I groomed all of the west side trails down to the potato fields by Hwy T and met Dan Pries there who did the return trip. We had to stop grooming at the edge of the field there as the snow is completely melted. You can ride down that far and turn around. Saul Springs Road and Eickhoff road are awesome but you will ride some snirty areas to get there. Today I groomed the entire east side and the situation is similar. Wildwood Trail and the roads down to Hemlock Dam are awesome. The sand based trails have some bare spots but are ridable. The Nicolet Trail is shot!!! I groomed a trail in the ditch line of the town road that runs along the trail north of the salt shed. You can unload across from the salt shed, work your way up that trail and take either the short or long loop up to Wildwood Trail and the county line. No reports from Forest County but the 100 Miler has been grooming so they must have some snow. Sorry there is not better news…we will keep grooming if the weather stays cold and we get even a little snow. Come on up for the Fish A Ree and Bed Races this weekend!!! Wednesday February 1st…Fellow club member Jim Wisneski and I rode our entire trail system this morning and put on about 75 miles. It has not gotten below freezing in at least 48 hours and it is beginning to show. Our trails were just getting in super shape and now sad to say they are getting thin. There is snirt starting to show on the woods trails but the unplowed roads were still good. The Nicolet Trail is OK up to the Valley Inn but stones are showing thru once you cross the road. What a bummer…we have had snow when the guys to the south did not. If it does not cool down and stay below freezing we expect to have conditions deteriorating further. Groomers are parked until then as they will do more harm than good….sorry to be so glum but mother nature is about the only thing we do not have any control over. Saturday January 28th…no riding today. We had our club Groomer Storage dedication, Bonfire, Vintage Ride today. Over 250 members and local residents were on hand for the ribbon cutting and a visit my AWSC Miss Snowflake Emily Bauer. Full details under the events tab. A great day for the club!!! Friday January 27th… Another 125 mile day for a three day total of a little over 400 miles. We went up to Armstrong Creek via the 100 miler out of Wabeno…good trails all the way. Lunch at the Green Shack in Armstrong Creek was great and owner Jerry is great guy to chat with. Food was wonderful. We went north on the 100 Miler to the Nicolet Trail and the south to Cavour. Took the cut off to Johnnies and the south via the old Red Ball past Windfall Lake to Barb’s Valley Inn for a pit stop and then home. My brother Mike was glad to have had such a great three days of riding. Thursday January 26th…another great day on the trails with my Red Arrow friends and about 135 miles on the clock. We rode north on the Nicolet Trail to LMT 2 and went the back way to Wabeno and on to Laona for breakfast at the Double Buck Cafe…great food. Then we doubled back and took LMT 8 over to the Roberts Lake area and on to the Wolf River Trail. The LMT guy had some groomer equipment issues but are now going full force to get the trails ready for the weekend. The Wolf River Trail was very good all the way down to White Lake with stones coming thru in a few places. We headed east for a pit stop at Animal’s Bear Trail and then took the Red Arrow trail north to Barb’s Valley Inn…awesome all the way!! Lots of sleds at the Valley Inn and on the trail. Got to try out a 12 Yamaha Apex with power steering as the guys from TA Motorsports were at Barbs…quite the smooth ride and easy steering. Finally brother Mike and I cut across the Townsend Flowage and Reservoir Pond to Beaver’s for dinner…a great Chicken Wrap and some cheese curds did the job for us. Jason is really getting things going there and now serving great food. Back home about 7PM….GREAT DAY AND GREAT RIDE!!! Wednesday January 25th….Great ride today!! Five fellow club members including my brother Mike and I rode about 140 miles today. We started out in Townsend and took the “short loop” up Wildwood Trail and on to Carter, Wabeno and Laona on the way to Tipler and the Whitetail Inn. Lots of snow north. Some of the Nicolet Trail was “bumpy” but that was due to the groomers not making enough passes yet. By the weekend it should be great if it does not get too warm. After a great lunch at the Whitetail we headed back south and took the cutoff to Arrogone. This trail is usually great and it was in most places. Again a little more grooming should make it really nice. We stopped at Johnnies Resort for a short visit and then headed to Laona and south on the Nicolet Trail. A pit stop at the Valley Inn (bar with the snowmobile on the roof) turned into eating dinner there. Great food!!! Bottom line is it was a great day to be out on the trails and the riding conditions were mostly top notch…tomorrow we ride again!! Saturday January 21st….first time out in a few days. Rode around most of the Townsend Red Arrow Trails inspecting conditions and picking up rocks and limbs. About 60 miles total in about 2 1/2 hours. Conditions are generally good to very good considering the small amount of snow we have gotten recently. The only really poor areas are some spots where the hunters trucks rutted up the trail last fall. Other than that I would call it good to very good. Met 3 groups looking for directions. All of them said they thought our trails were in very good condition so that made me feel good. Two guys from Rockford, Ill were on a scouting mission and are bringing a bunch of people back in a couple of weeks. They said they liked our area better than Minocqua!!!! So…come judge for yourself…no guarantees as everyone has a different opinion on what good, very good and so on mean. Friday January 13th…much better news than the last report below. We got about 4 inches of fresh snow Wednesday night and Thursday into the evening. I was out grooming Thursday afternoon and did the west side run to Animal’s Bear Trail. In places there is lots of snow and conditions are very good. In others the ruts are not filled in and it is poor so be careful if you want to go down that way…one more big snow should make things really good. Today five of us rode about 80 miles going north again. We took the short loop and Wildwood Trail and it was great except for a couple of short stretches. The Nicolet Trail north is in very good condition with a few stones coming thru north of Wabeno. We took the cutoff to Johnnies Resort in Laona and after the first mile in town things were pretty good. We left Johnnies and headed up Corridor 9. It was great on the unplowed roads but the railroad bed section was bumpy but rideable. At the intersection with the Nicolet Trail we headed back south to Townsend and took Wildwood Trail and the long loop back. The section between Hemlock Dam Road and Pickerel Lake Road still has some ruts but is rideable if you are careful and go slow. Considering the total amount of snow so far things are pretty good!! Friday January 6th….Bummer, the air temperature is 36 degrees and the stars are out as I write this at 6:30 AM….. it will be a warm sunny day. We tried to ride north yesterday and the trails were great but my Yamaha did not pick up any lubrication from the wet snow so we headed back home with only 35 miles on the clock. I won’t be going out again until it cools down and we get some fresh snow. Wednesday January 4th, 2012….what a difference a week makes. We had 4 inches of fresh snow on New Years Eve and the groomers got busy. The Nicolet Grade north of the Halfway Bar is in good to very good condition per club members who rode it today. Trails south of there are still closed. Six of us made a 110 mile trip up to the Whitetail Inn in Tipler today. We started by taking the short loop into the woods in Townsend and went up Wildwood Trail. Except for one small stretch off Pickerel Lake Road the trail was in great shape. The Nicolet Trail was in GREAT shape all the way to Tipler. A section from Cavour to Long Lake had not been groomed on the way up but we met the groomer on the return trip. It was quite amazing….very few of those pesky cinders that you usually get north of Wabeno. I would call the whole grade Very Good. We saw that the cut off to Johnnies Resort at Cavour was freshly groomed as well and that is road all the way so it should be a nice run.We did not get off the grade so cannot speak to the intersecting trails in Forest County. In Townsend any trails that are on unplowed roads are good to very good. The woods trails are groomed but there is not enough snow to fill in the ruts so be VERY Careful when you ride. Come on up and go north for some pretty decent riding. Wednesday December 28th…Bummer….our trails are still closed and no snow in sight. This has to be one of the slowest starts to the snowmobile season in many years. All our trails are brushed, signed and ready to go. The Nicolet Trail and woods trails on closed roads will be in good shape with a few inches of snow. Those trails in the National Forest that were open to hunters are rutted and bumpy. It will take several good snowstorms to get them in the great shape you expect. Be very careful riding in these areas when the trails do open. Wednesday December 21st….As noted elsewhere on this site our trails are still closed. About 500 hours of effort by club volunteers have our trails in some of the best shape ever. Our new groomer building is finished and the groomer drivers are itching to get out and do some grooming. Now it is up to Mother Nature. Stay tuned!!! 2011 Season Ends Wednesday March 23rd…We closed our trails a day or two after the post below due to lots of mud even in the woods. Today we got 12-14 inches of fresh snow. I am making this post to share my frustration with that last week warm-up that ended the season. However, Forest Service and other gates are already closed and will not be re-opened. Bummer….see you next year or on your ATV if you enjoy both sports. Wednesday March 16th….All the trails around us are closed but word is we have lots of snow in the woods so Red Arrow is staying open for now. I decided to check things out this morning for myself and rode our entire system. All the woods trails are smooth and fast with plenty of lubrication. Some hills (especially the one south of Fanny Lake Road) are burned out and you will have to ride in some short stretches of dirt!! For the most part (95% or more) the woods trails are very good and rideable. The Nicolet Grade is shot but some folks are riding the town road alongside of it with some success. Overall , you will have to decide if one last ride is worth it. My 45 miles today will, I believe, be the last of the season for me…Bummer but thanks to all of you who have been reading my posts…See you next year!!! By the way, if you want to comment about these reports or your riding up here e-mail me at jbrantmeier@athenet.net I’d like to hear from you!! Saturday March 12th…Troy Mleziva, my son in law and I took a shorter version of yesterdays ride by going straight up the Wolf River trail to Lily and back to Townsend. Also checked out the Red Arrow east side loops. All trails were in great shape as we got 3 inches of fresh snow Saturday morning. 65 miles of fun!! Hoping for one last ride or too this upcoming week. Stay tuned. Friday March 11th…Jim Weyers, his son Matt and I got out on the trails at 7AM this morning. We rode the entire east side of our system and they were smooth and fast. Went down to the Airpark and turned around to go on our primary ride to Langlade County. We took our trail past the Valley Inn and saw that the 100 Miler had been thru up towards Ada Lake Road. Nice job…again flat and fast. We dropped down the Bob Kroll Memorial Trail and shortly found Dan Pries stopped with one of his old Ski-Doos. We helped him fix a muffler and rode together down to Saul Springs Road where he cut off towards Animal’s and we went to Langlade. The Langlade groomers had been out and we followed them all the way from Saul Springs to Polar with a stop in White Lake for gas. First ones out so the riding was sweet!! Then we went up to Bryant and north and east back to Lily. The only ungroomed trail was a piece towards Lily but once we got on the Lily club trails they were freshly groomed. Stopped for lunch at the Lily club house and headed east on the Lily trail to Ada Lake Road. Again freshly groomed. We got on the 100 miler (groomed early today) and headed back to the Valley Inn and back around our long loop on the east side to check things out. Still very rideable and smooth because of a thick base. Back home about 1PM with 120 very enjoyable miles showing on my Yamaha Vector…My guess is there will be good riding again tomorrow as it is supposed to be cooler and there were not a lot of sleds out today. Thursday March 10th…Dan Pries and I got out on the trails by 8:30 and had some great riding. Lots of fresh powder. We put on about 85 miles around the Townsend area and west towards Boulder Lake. Overall good to very good late season conditions. Suggest that if you are going to ride this weekend that you get up early and ride to noon or so if the sun is out. Too bad it is so warm…the fresh 4-6 inches of snow was great!!! Wednesday March 9th…Ron Popp and I took a ride today in the fresh falling snow. There were only four other sleds to be seen all day. The fresh power riding was great even though there were some stutter bumps underneath as we got into Langlade County. We basically covered the same ground (in reverse) that Mike and I rode on Friday but weekend riding pressure took its toll. Really not too bad for this time of year but not “perfect” like on Friday. We called one of the club members from over that way and were told that they would be grooming Thursday morning all the way over to Boulder Lake. Not sure of how the rest of the Langlade system will be groomed but there is plenty of snow cover for some great riding. We rode home on our Red Arrow trails from the south and they are awesome!!! Freshly groomed this morning and a couple of inches of fresh stuff on top of that. Back home with 110 miles of pretty darn good riding. I got in our John Deere when we got back and “panned” the grade so that it freezes down. There is more snow on that trail right now than we had most of the year. No base though so it may go away quickly. Friday March 4th…Mike and I got up early and were on the trail by 6:45AM. We took the same route across our flowage and Reservoir Pond and were pleasantly surprised to see the Radish connector trail freshly groomed. Thanks Dan Pries!!! This time we stayed on our trails down past Boonie’s (soon to be Beaver’s) and up Pine Tree down to Saul Springs Road…awesome all the way!!! Then we headed into Langlade County and took the first intersection south to Fish Hatchery Road and Langlade and on to White Lake for breakfast at the White Lake Cafe…45 miles by 7:30 not a bad start and a great breakfast. After getting back on the Wolf River grade we headed up to the first intersection and turned towards Antigo. Some of the wooded sections were thin but 75-80% awesome riding. Gassed up in Antigo at the BP and checked things out west of Hwy 45…not good…very little snow so we turned around and came back and headed to Bryant. The potato fields are awesome…hard packed and plenty of powder drifted in. At Bryant we headed north 3-4 miles and then took a right to Lily. The “upper trail” to Lily was 21 miles of sheer joy…groomed, fresh powder and only a couple of sleds ahead of us….it does not get any better than that ride. We came our right by the Lily clubhouse and tried out the grade north. Not a good idea. The big stones were coming thru as far as we could see. Turned around and took the trail back toward Ada Lake road. Good all the way but the LMT/100 Miler part was bumpy and thin east of Ada Lake rd. We were glad to hit our trail at Diamond Roof and back to the Valley Inn. Checked out all the east side loops and all were freshly groomed. We turned around at the airpark and retraced out steps to the Valley Inn. Took the Bob Kroll Memorial down to Carl’s Kiosk, back up past Boonies and home. 141 miles of fun…maybe 10 miles of so-so conditions but well worth it for the rest. Thursday March 3rd…Brother Mike is up from Sherwood for a couple of days of riding. We went across the flowage and Reservoir Pond and down to Boonies and south past Maiden Lake and Halfway Bar. South of Star Lake Road there is a lot more snow and conditions gradually got better and better. We took Mountain Lakes Road and Blue Spruce Rd over to Boulder Lake and then west to 9Mile Bar and Grill for lunch. Trails had some stutter bumps but not bad. As we left 9 Mile it started to snow hard and soon we were riding in a couple of inches of fresh snow. Took the new cut off trail from 9 mile to the Wolf River grade south a little and the up toward Bryant but turned back east to the Crocker Hills. That 11 mile stretch thru the hills was awesome. Smooth, fresh snow and very scenic. Crossed the Wolf at Lily and headed back south on the Wolf River Trail to the 9 mile cut off and down to Saul Springs Road. Wow…that trail was great with the fresh snow…pedal to the metal!!! The Red Arrow trail was pretty darn good all the way to the Valley Inn and back to the Surprise Lake road intersection. We cut across Surprise Lake and the Townsend Flowage to avoid the grade and back home. 112 mile ride with about 75% very good, 20% so so and 5% plain awful!! With the fresh snow and some more coming you can find good snow west of Townsend over into Langlade County. Tuesday February 22nd…Today a group of fellow Red Arrow members met at the Shell Station for a club ride. We headed south past Cathedral Pines and then over to “Boonies” and south on our Red Arrow Trails to Animal’s Bear Trail for lunch. Great conditions all the way. After lunch some members headed back to Townsend…we went West to Langlade and the north on the Wolf River Trail to Lily…lots of good snow cover. At Lily we headed back towards Townsend via the LMT trails. The further east we got the lower the snow cover. By the time we got to the 100 Miler south to Townsend the snow was sparse…in a couple of days it will be unrideable. LMT is not grooming due to low snow. stop at Barb’s Valley Inn and then we took the Townsend short loop off Wildwood to avoid our grade…also low on snow. A nice 75 mile ride with good friends. Lots of snow in the trees made for a beautiful day!!! My advice..ride south of Townsend for some good trails. North of Wabeno there was hardly more than a dusting out of the big storm. No more riding this week for me as personal matters need attending to. Come on up and have some fun!!! Monday February 21st….We are back in business. The snow this weekend will make our trails rideable again. Took a quick 30 mile ride today. First south past “Boonies”s to Pine Tree, Carl’s Kiosk and back toward the Valley Inn. First one out and riding in the fluff was big time fun. Met our Ultimate groomer with Dan Pries at the controls by Sawyer Lake road. Lots of snow in that area and the snow was laying down very nice. A fast, flat run up to the Valley Inn. Crossed Hwy 32 and took the Nicolet Trail up to Wildwood Trail east…again lots of snow and freshly groomed by Ron Popp with our John Deere. As i got down towards Hemlock Dam road and the trail to the Ruffed Grouse area the snow was quite a bit less. Still rideable but more ice showing thru….be careful. Back to Townsend, across the Townsend Flowage and home in a couple of hours. Bottom line…trails are flat and very rideable. Be careful of icy corners and some thin spots. We expect the groomed snow will freeze tonight and bond to the ice making conditions better yet. Come up and have some fun!!! Monday February 14th…..Bummer!!!! The warm weather has really taken its toll on our trails. There is plenty of snow in the woods so a little cold weather will allow us to get things back in shape. In the meantime I would strongly recommend that you stay off the trails to help us keep the snow we still have. On a more positive note our Fish A Ree was a huge success. Thanks to all who worked and/or attended this event. All the profit will go back into our efforts to provide the best snowmobile and ATV trails in this part of the state. As soon as we can get out and ride again I’ll get back to posting our riding trips. Thanks for tuning in!! Eight Red Arrow members stopped at the Post Lake Inn for lunch. Thanks Diane and Al for the great food and hospitality!!! Eight Yamaha 4 strokes sitting in the sun…waiting on the trail for some more winter fun!!! Wednesday Feb 9th… 8 degrees below zero this morning but a ride to Post Lake has been planned so off eight of us went…all Yamahas!!! We took the same route over to Lily as yesterday and then up the new Wolf River grade to Lily River Lodge, Pickerel Lake and up to Post Lake thru Hills Still. Kudos to the Pickerel Tombstone Club…Trails were great all the way to Post Lake. Lunch at the Post Lake Inn and then back home across Pickerel Lake and the 100 Miler home. Great day to be riding. 120 Miles of great fun. PS: We took the cutoff on the Wolf River Trail to 9 mile bar and back to Townsend. Saves miles and that knarly bridge at Langlade. Wednesday Morning Feb 9th… 3 degrees above zero yesterday at 10:30 AM but we ride anyway leaving from Townsend Shell. We took the grade north to the trail east just north of town and then the Carter Long loop and Wildwood Trail back to the Nicolet. This area of the grade is thin so a great alternative to ride the woods. Turned right up the grade a short ways to LMT 2 and then dropped down to the 100 Miler to the Lily cut off and over to Lily. Not a rough trail all the way…all were freshly groomed!!! We took the Wolf River Trail north to the Lily River Lodge cut off and over to Pickerel lake for lunch at the Final Lap (Great Burgers) and then backtracked to the Wolf River Trail north almost to Crandon. We took LMT 6 back towards Roberts Lake and then headed home via the 100 miler and LMT trails to the Nicolet Grade to Wabeno. We took the back LMT trail past the water tower back down to the 100 Miler and back home. The trails were all great…hard and fast with the cold weather and not many sleds out. About 105 miles of great fun and not even feeling cold with lots of layers!! Monday Morning Feb 7th….no riding the last few days as too busy with the upcoming Fish A Ree and the final touches on my 1971 Ski Boose restoration project. Grandkids were up for the Super Bowl (How bout dem Packers) and getting it finished was #1 priority. We had a great time riding around the lake and attending the Kids snowmobile races over at My Bar. Our 3 year old granddaughter got to sit on one of the Kitty Cat racers!!! Maybe not such a good idea…she seemed to be very excited about the races and being around all the kids. Anyway, well worth the time and expense even if I am a “died in the wool” Yamaha guy!!! Come on over to our Fish A Ree this weekend….details on the home page of this site. Wednesday February 2nd….Club guys ride today to White Lake and Lily. We took the Carter long loop north to the county line and then dropped south on the Nicolet past the Valley Inn and up Mosquito Lake Road and down the Bob Kroll Memorial trail to Saul Springs Road and east to Langlade County. Our club had groomed all this in the last day or so…awesome!!! We took the first T in Langlade County right and up to 9 Mile Resort (closed on Wednesday) to try out the new “shortcut” to the Wolf River trail. Lowell at 9 Mile is grooming about a one mile section with a snowmobile groomer this year in hopes it will be put on the map next year. Hope it does as this avoids that gnarly bridge at Langlade. We took the Wolf River Trail to White Lake for lunch and then backtracked on the Wolf River and up to Lily. This grade has settled down….no stones and nice and smooth all the way. At Lily we headed back towards Townsend via Corridor 9/16 and LMT 2 to Carter. Then we dropped south on the Nicolet to Wildwood Trail (short or long loop to Townsend) and took the short loop home. A great day with mostly smooth as glass trails. The only bumpy part is the first part of the trail right in Langlade County and about half way to 9 Mile. Small price for a great 85 mile ride!!! Tuesday February 1st…Big trip today on the 100 Miler. My friend Jim and I took off from Townsend Shell and headed north on the Nicolet Trail (grade) to Wabeno. We turned left just as you come into town. Don’t be fooled by the gnarly looking street you ride. About 1/8 mile the trail opens up and was freshly groomed all the way to Armstrong Creek…great ride with only a couple of plowed town roads keeping it from being perfect!!! Got some gas at Armstrong Creek and headed north on the 100 Miler to reconnect with the Nicolet Grade. Again freshly groomed and only 3 sleds all the way from Townsend. WOW!!! We headed south on the grade a mile or two and took the cut off to Arrogone. This can be bumpy sometimes but today it was smooth as glass all the way. The Arrognne groomer was broke down several miles north of town but there was only a mile or so between the breakdown and where the 100 Miler takes over. You may want to check if it was repaired before riding as that trail can break down quickly. Stopped at Arrognne for lunch and then headed south on the trail to Crandon. Turned left towards Johnnies and back to Townsend via the 100 Miler trails. Again, freshly groomed all the way!!! As we rolled into town my odometer read 145 miles of Flat Fast Fun!!! Thanks guys for getting the trails in such great shape!!! Friday/Saturday Jan 27/28…No long rides…time to work. On Friday i put about 25 miles on my 2-up Venture fixing some trail signs and putting up posters and banners for the Bonfire and Fish A Ree. On Saturday my wife and i went out to the bonfire and spent most of the afternoon there. Great time with lots of sleds stopping. Many club members stopped to say hello…Thanks Dan, Clint, Jeff and Pat for planning and holding this nostalgia event. Lots of old sleds on display including a genuine 1970 Sno Pack in Packer colors from day one….awesome and thanks Dan for bringing it out. Thursday January 27, 2011…With some different club members we repeated Tuesdays trip thru the Paul Bunyan and Iron Snowshoe trails to Crooked Lake and back. All were still in great condition. We did take the 7 mile cut off into Crooked Lake across the lake to the Pines. After “shooting the breeze” with Mike the owner we backtracked to the Paul Bunyan system and thru Lakewood and home. About a 70 mile day of great riding. With snow in the forecast life is good!!! Wednesday..January 26th, 2011…We got an early start today because of a Red Arrow board meeting tonight. After gassing at Townsend Shell we took off north via the Carter Short Loop and past the Valley inn and up the 100 miler to Johnnies Resort. Too early to stop so we pressed on up the old road trail to the grade. Too bad they are logging but at least there is an ice base. At the intersection with the grade we followed the groomer up the old trail thru Cavour and back to the Nicolet. Decision time…go north or back to Laona. We chose Laona but the 9-10 miles back was crummy. Lots of stones coming thru all the way. Need some wet snow for a good base. We ate at the Double Buck and then took LMT 7 down Bushaver Road and turned south to Wabeno and back to the grade. Very good all the way!!! More stones on the grade to Wabeno…we are not riding the railroad grades again until we get some heavy wet snow!!!! Took Corridor 16 west past the water tower and back south to the 100 Miler. If you have not ridden the “Water Tower Trail” it is awesome to ride and a stop at the overlook is a must. We connected up with the 100 Miler and back home to Townsend…..right at a 100 mile day with great trails except for the grade. 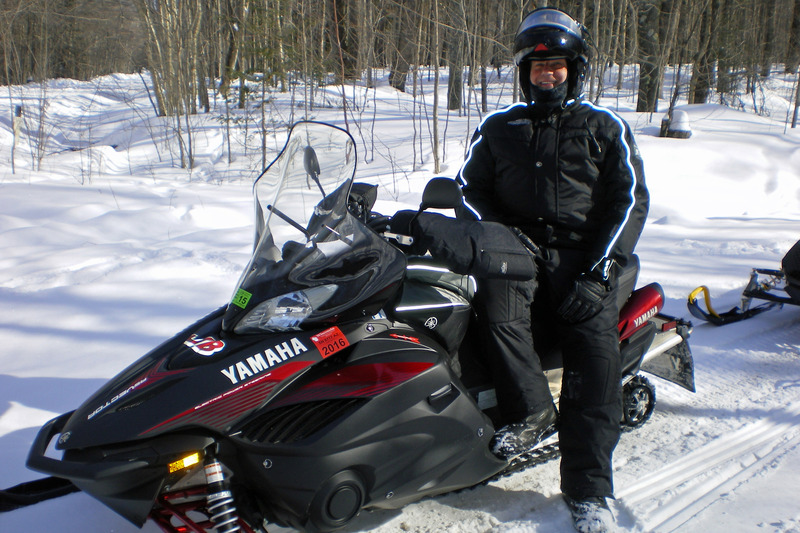 Tuesday..January 25th, 2011….Another great day to snowmobile. Some friends and I met at the Shell Station in Townsend and showed the MS Tour guides how to get across the Townsend Flowage and Reservoir Pond and points south. We took them down Pine Tree to the “Carl’s Kiosk” intersection where the MS group headed south to Langlade County. We took our club trail north up to the Valley Inn, crossed to Wildwood Trail and past the Ski Hill towards Crooked Lake. I’m not real familiar down that way but we rode Chickadee Road…what a blast!!! Turned east towards Crooked Lake and Iron Snowshoe trail F but decided to go to Mulligans for lunch so looped back thru the Tornado area. It was pretty darned good all the way with nary a bump in site thanks to the Red Arrow , Iron Snowshoe, and Paul Bunyan groomers. After a great lunch at Mulligan’s we headed for home….about 75 miles of great riding!!!! Be on the lookout for groups of riders with orange flags Thursday thru Saturday. The Wisconsin Multiple Sclerosis Society has their annual fundraiser at the casino in Carter. Give a big wave for a great cause!!! January 20th, 2011…Today was my day to “Take a Friend Snowmobiling”. The DOT transportation planner who was responsible for our beautiful Nicolet Trail thru Townsend had never been on a snowmobile (or an ATV for that matter). After months of e-mails and planning two members of the local Forest Service staff and I took off with him about 9AM for a great day. This was after about an hour of practice out on the Townsend Flowage to get the hang of things. I provided the machine, helmet and warm weather gear. Our trip took us up the Nicolet so the “fruits of all the work” could be seen and used first hand. Then we went up Wildwood Trail to show the Forest Service guys what a great trail it now is. Without the help of the FS guys I was riding with the upgrades to that trail would have been difficult if not impossible. We backtracked past the Valley Inn and took the Bob Kroll Memorial trail all the way south of Hwy 64 and then on to Chute Pond club trails to Boulder Lake and on to Langlade and White Lake. The White Lake cafe was a welcome stop for lunch as the temperature never got about 10 degrees all day. After lunch we headed north on the Wolf River Trail with a stop on the bridge over the Wolf River. What a view and photo op!!! Then up to Lily and a turn east across the 100 Miler trails and back home to Townsend. The trails were great and I think our DOT friend was impressed. As he is involved in projects that include snowmobile issues he will have a better understanding of our sport and the need for safe access when state highways are involved. Thanks to the Forest Service guys for coming along…we rode on a lot of National Forest trails and it was a great opportunity for them to see the Forest footprint in the winter. Do your part…take a “newbie” out for a day and show off our sport!!! January 19th, 2011….Today we teamed up with several club members for a ride to the Whitetail in Tipler and back. After meeting at the Shell station we took the Carter short loop and doubled back on the Nicolet to the Valley Inn and up the 100 miler to Ada Lake and on to the Roberts Lake and Corridor 9 trail near Johnnies Resort. Then up the “back way” to the Nicolet Trail north of Laona and up the Nicolet to the Whitetail. Most of the riding was superb with a few stones coming thru on the grade. After a great lunch we came back on the Nicolet (more rocks showing) to south of Laona and took LMT 4 east around to the 100 Miler and back to Wabeno. Pretty darn good all the way. The Nicolet is becoming very near unrideable from Laona to Wabeno. At Wabeno we took Corridor 16 east past the water tower and down to the Carter cut off at LMT 2 and back to the Nicolet home. A great 140 mile day of fun and great riding. Think snow!!! January 18th, 2011….Rode with some club members today. We took the Carter short loop north and came down to the Valley Inn and rode our trail all the way south to Saul Springs Road and west to Langlade county. Super smooth all the way!!! We went north (right) at the T just into Langlade County and headed for Lily. Trail was somewhat bumpy and lots of logging activity so would recomend another way to Lily if you can. At Lily we took the Wolf River grade south to White Lake for lunch…very nice on the grade with a few stutter bumps here and there. We doubled back from White Lake to Langlade, up Fish Hatchery Road and back to Saul Springs Road and back home. All Red Arrow trails are excellent and the Langlade County trails are very good considering they got less snow over the holidays. About 85 miles of fun….up to the Whitetail Inn tomorrow with the guys. January 13th, 2011…took the same trip as yesterday as far as Lily. They had 2 inches of fresh snow there last night. Down the grade to the Bryant cut off. Went about 5 miles and it was REALLY BUMPY AND ICY!! Turned around and came back to the grade and over to Langlade and then to 9 Mile Bar for lunch. Back down the trail towards Red Arrow trails and home. Great conditions all the way except for that trail to Bryant. Again just about 100 miles of great riding. With snow on the way conditions should be the best of the season in the surrounding area. We hope to do some riding further north next week. Stay tuned but come on up if you are even thinking about it. Trails are great!!! January 12th, 2011…Took the long loop to Carter today and then came back to Mosquito Lake Road and up the 100 miler to Intersecton 95 and turned south to Lily. Great trail all the way. At Lily we took the new grade (Wolf River Trail) south to White Lake and stopped for lunch. Then on to Langlade with some bare spots in the open fields but not bad. Back home via Red Arrow Trails (all in great shape) via Valley Inn and back to town via the Carter short loop. 90 miles of great riding with my Yamaha friends. January 11th, 2011…Just got back from a 95 mile ride north on 2 inches of fresh snow. Ron Popp and I took our Red Arrow “Carter Long Loop” to avoid the bare grade and then swung down to the Valley Inn…then north to Forest County via Mosquito Lake Road Trail. The 100 miler portion north in Forest County was great but as soon as we got on LMT trails the riding got bumpy in some spots. Their back trail to Wabeno was nice going past the water tower. We crossed over to the Nicolet Trail and headed north and ran into lots of gravel due to lack of snow. We headed west at the first turn and picked up LMT 7 to Laona…big mistake…lots of bumps and some low snow spots. At Laona we headed north on the Nicolet and it was great up to the cut off at Cavor where we turned left and headed to Johnnies for a pit stop. Then we headed home on the old “Redball” which is basically Corridor 9 south from Johnnies until you turn off to come back to the Valley Inn. Pretty good all the way with a few spots that were icy or bare. Bottom line…avoid the grade (Nicolet Trail) and stay on Red Arrow and 100 Miler trails as much as possible and it will be a great ride. December 29th, 2010 Today was the first ride of the season for me. We took the “long loop” around our system and back to the Valley Inn and then down to Animal’s. Trails were good to very good all the way. Thanks Groomer Guys!!! After a quick stop at Animals we went down the Chute Pond trails to the Waters Edge at Anderson Lake for lunch…dollar burgers were great with the fresh cooked onions. Then over to Crooked Lake to see Mike at the Pines and back thru the golf course, air park and back way to Townsend. Overall a great ride with about 85 miles posted. The warm weather is taking a toll on the trails so in the shed stays the Yamaha until it cools down. Sept 6th, 2010 Well, Labor Day has come and gone so can snowmobile season be far away….actually in less than 100 days we will be on the trails with any luck. This past Saturday our club held its 4th annual Corn Roast and ATV parade at the Valley Inn. There is more information elsewhere about his but I just wanted to add my personal thanks for a job well done. There were lots of new faces helping and the huge crowd helped us make a big profit that will be reinvested in our trail upgrades and maintenance. Great job!!! Me, Josh and Mike enjoying a huge breakfast at 2B’s in Wabeno before heading our for a quick 100 mile morning ride. My Yamaha Vector on the Townsend Flowage at Sunset. I’ve been riding Yamahas for 38 years!! !